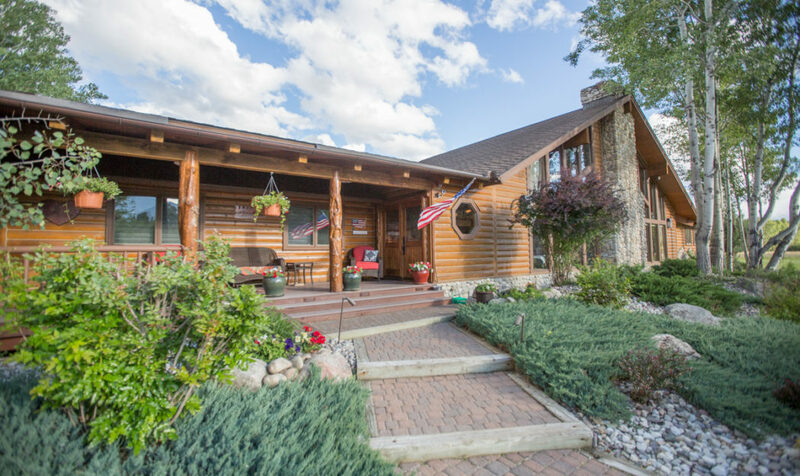 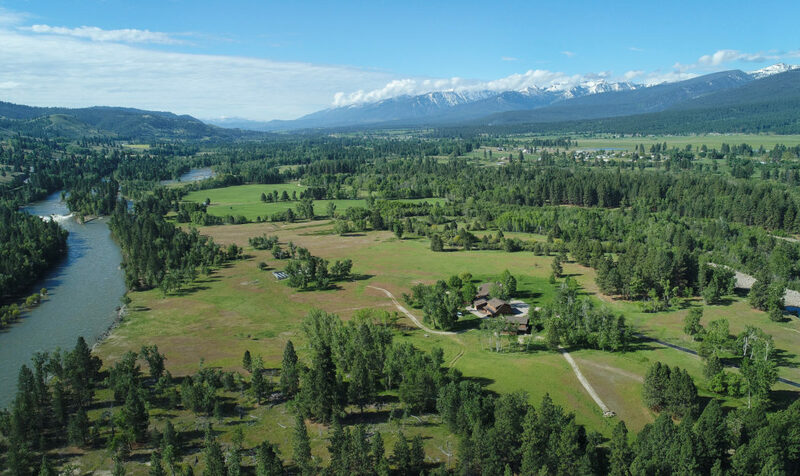 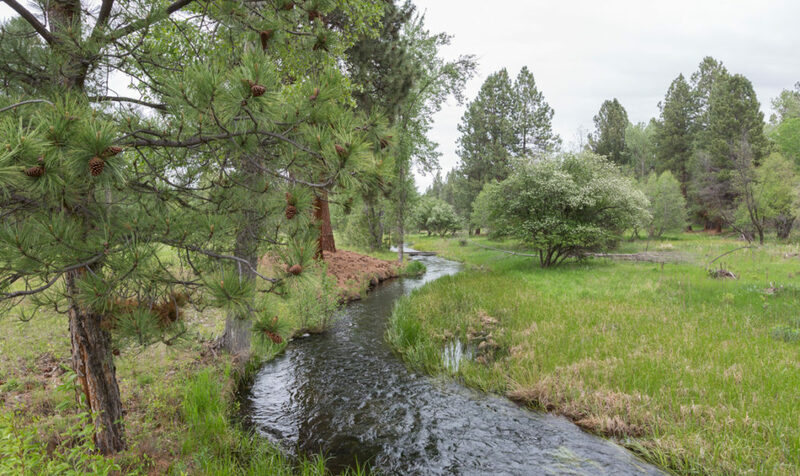 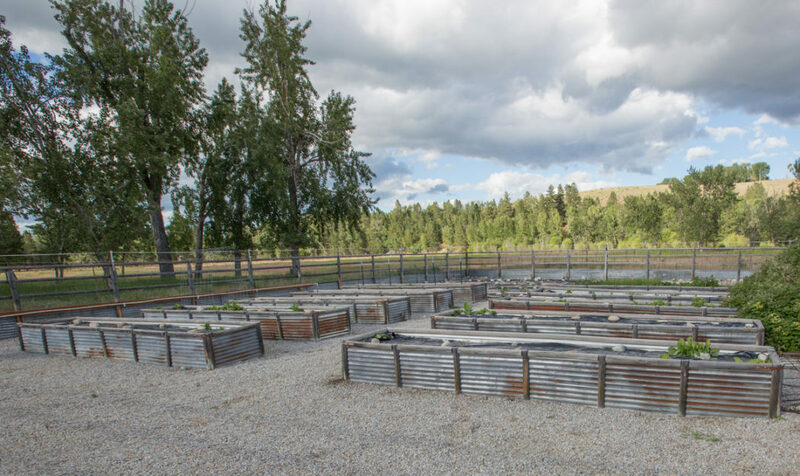 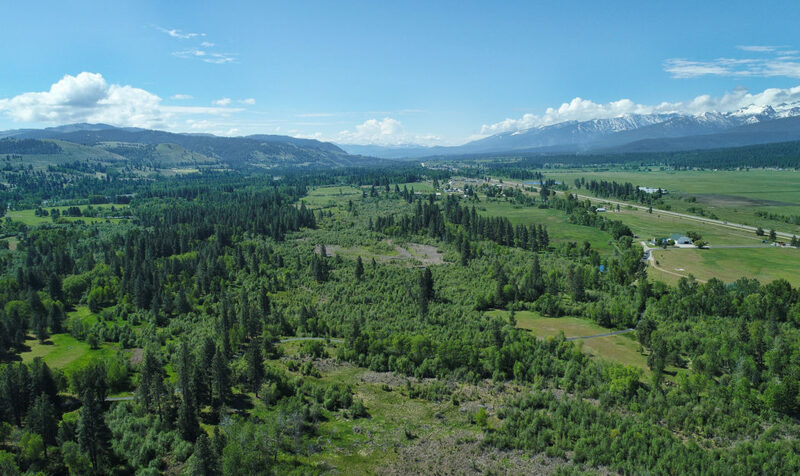 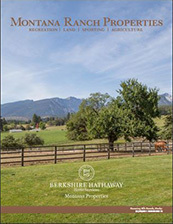 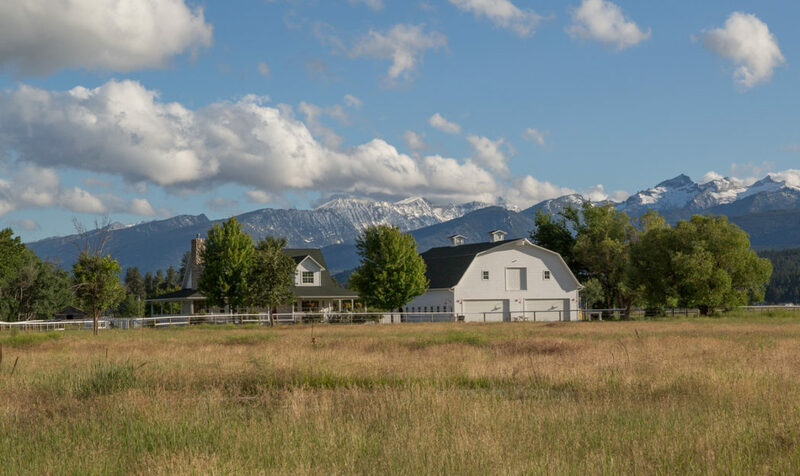 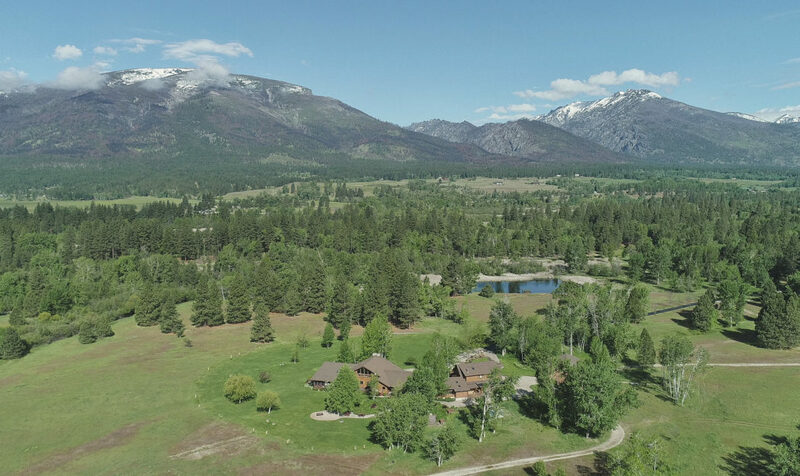 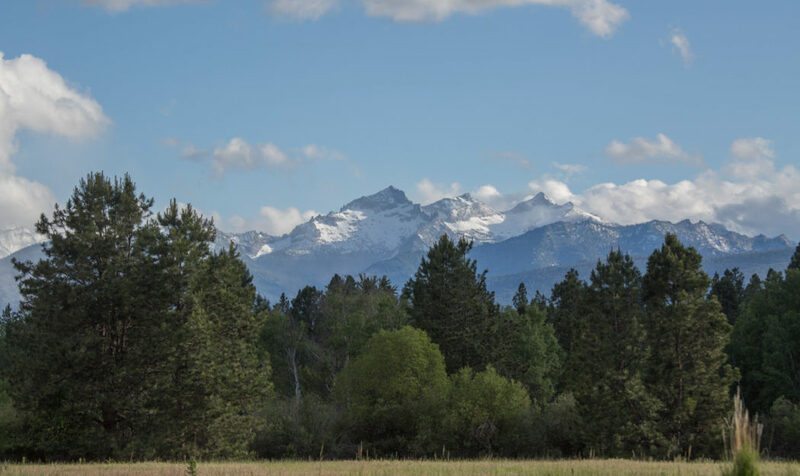 The “Ashlin Ranch” is a 347.29± acre first time offering in the beautiful Bitterroot Valley of western Montana with almost a mile of Bitterroot River frontage. 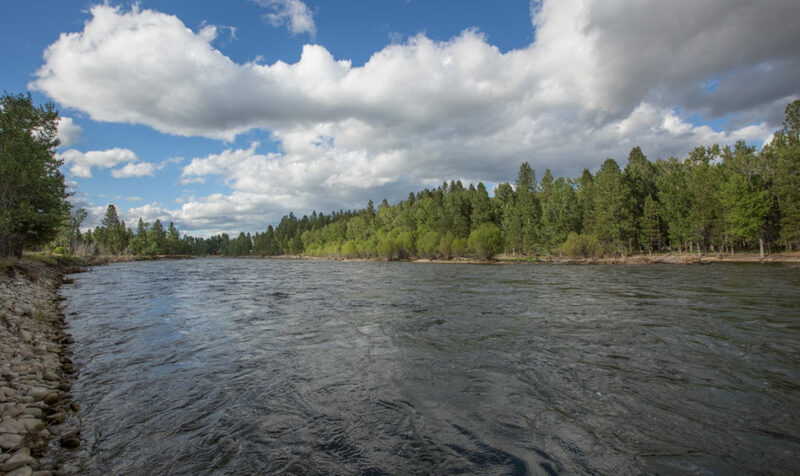 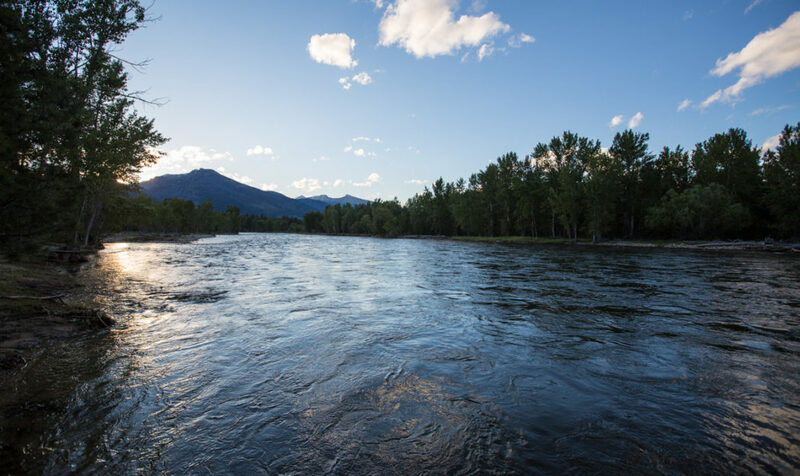 The river is well known by fly fisherman world -wide for scenic high quality trout fishing and floating opportunities. 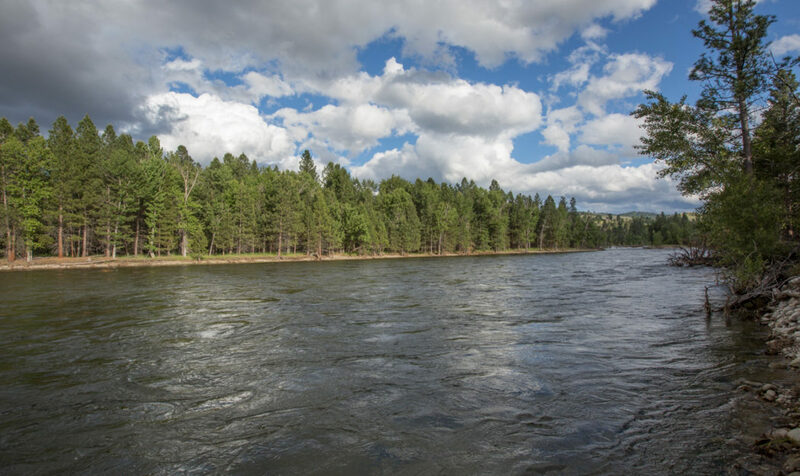 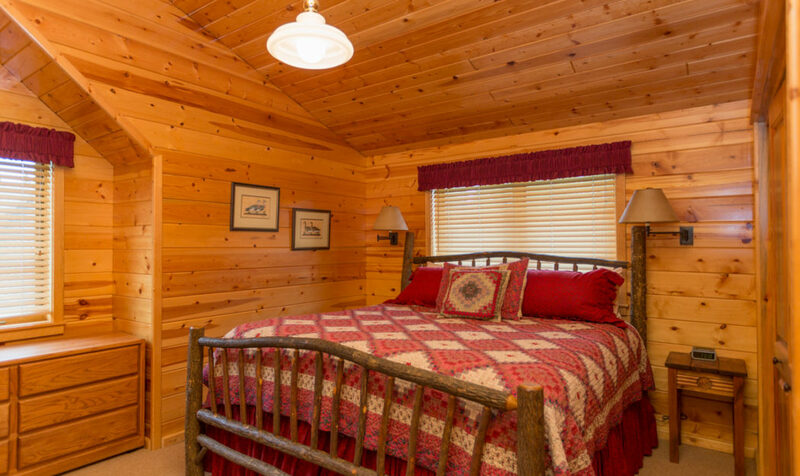 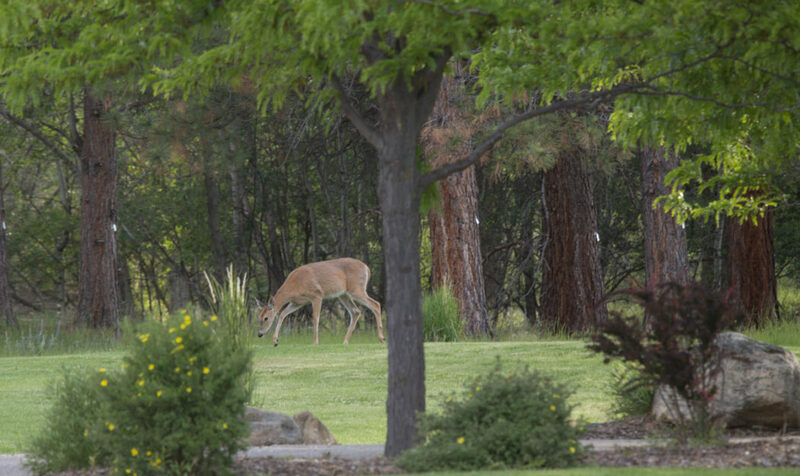 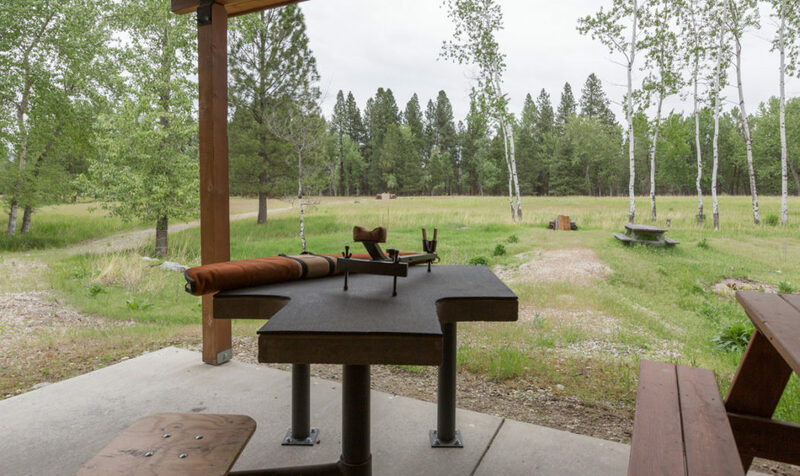 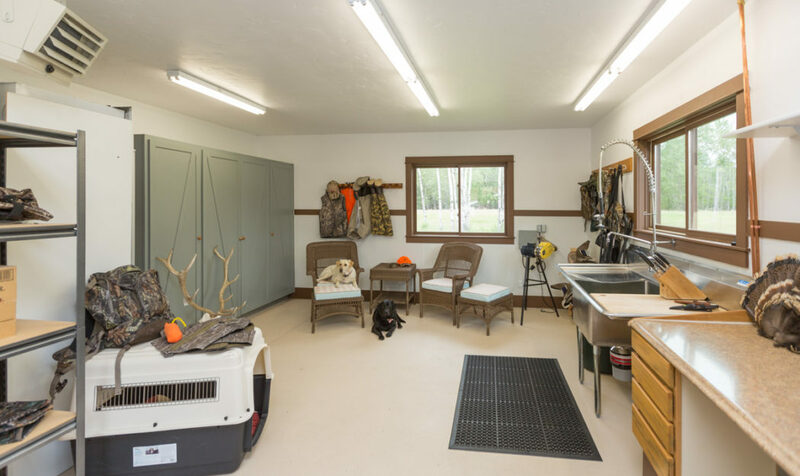 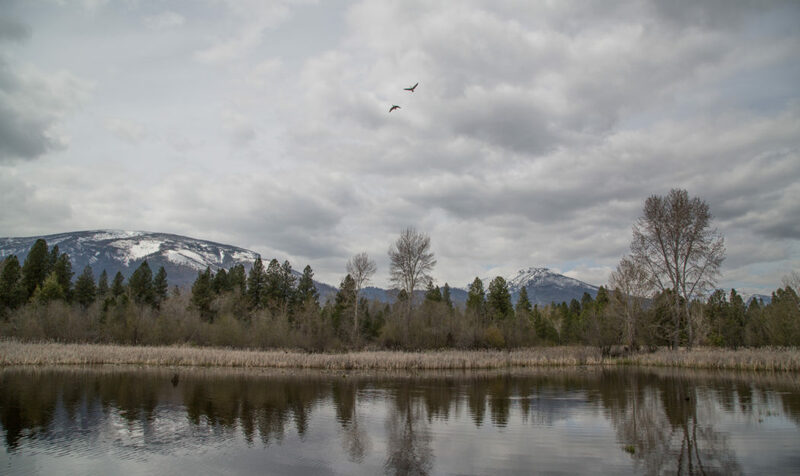 The land offers private recreation whitetail deer, elk, turkeys, waterfowl, and sporting dogs. 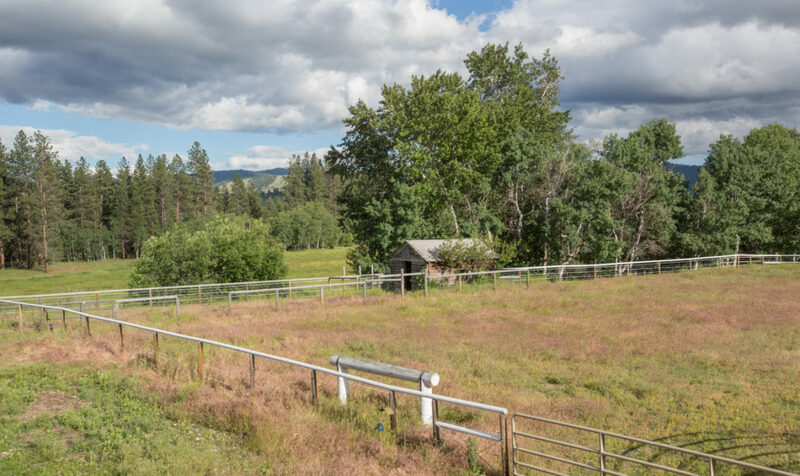 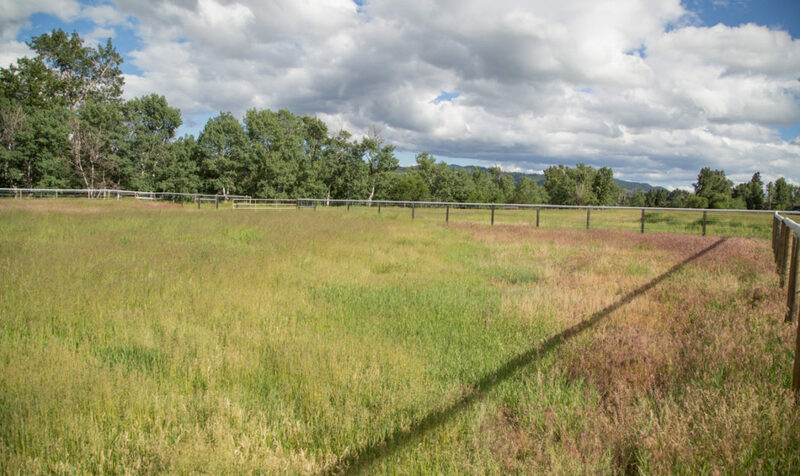 Irrigated pastures with water rights include approximately 130± acres for horses or cattle. 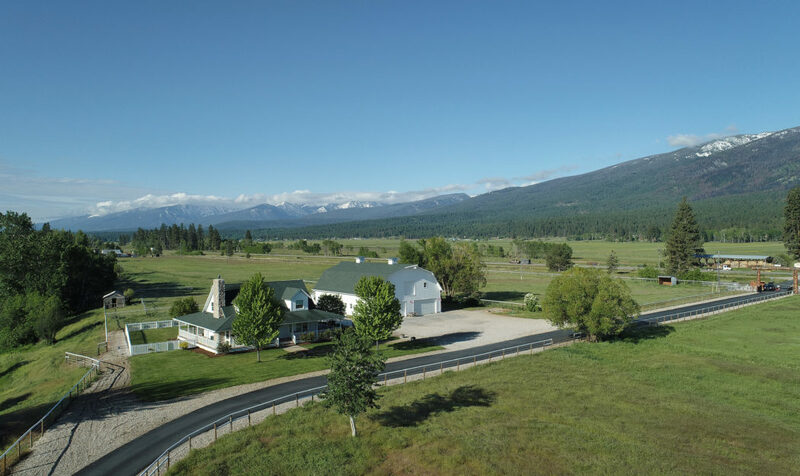 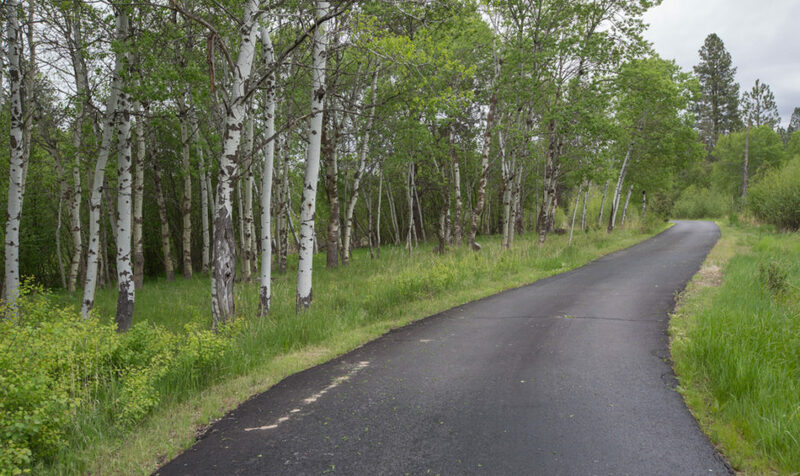 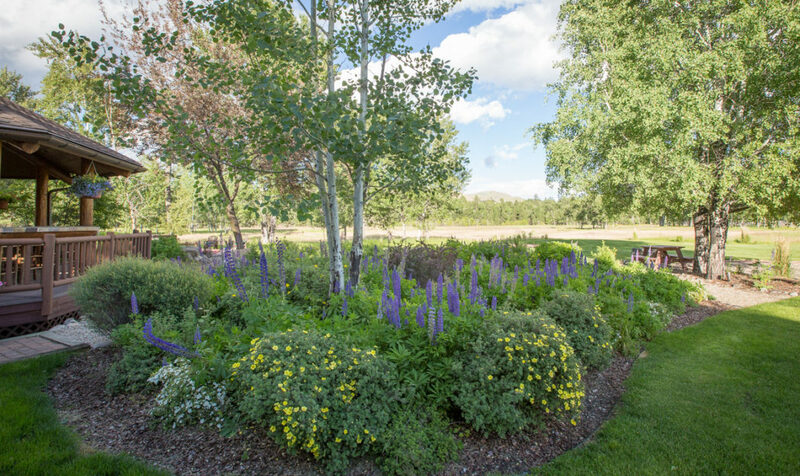 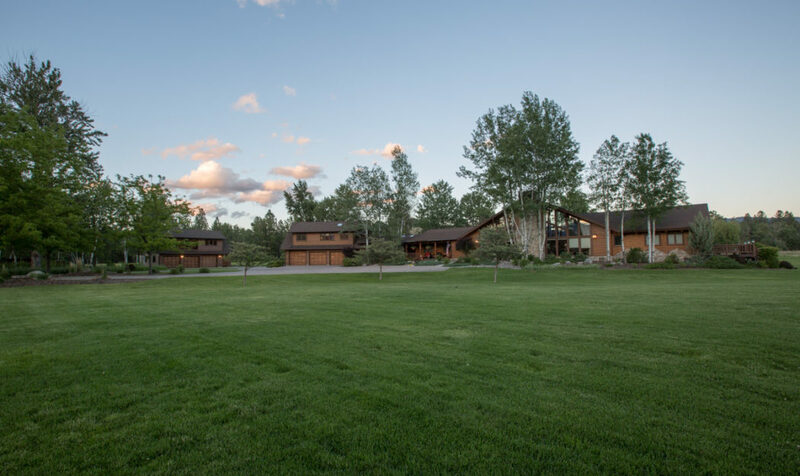 Other land features include mature pines, aspen, parks with trails, multiple large ponds plus a year around creek. 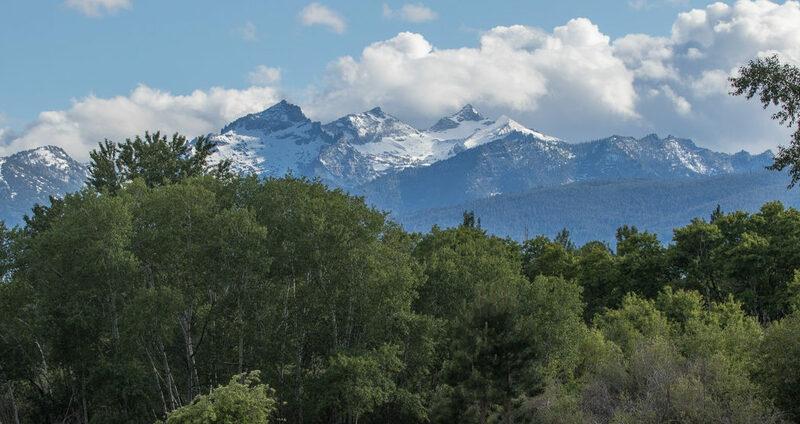 The mountain views of the Bitterroot Range and snow covered Como Peaks are inspiring! 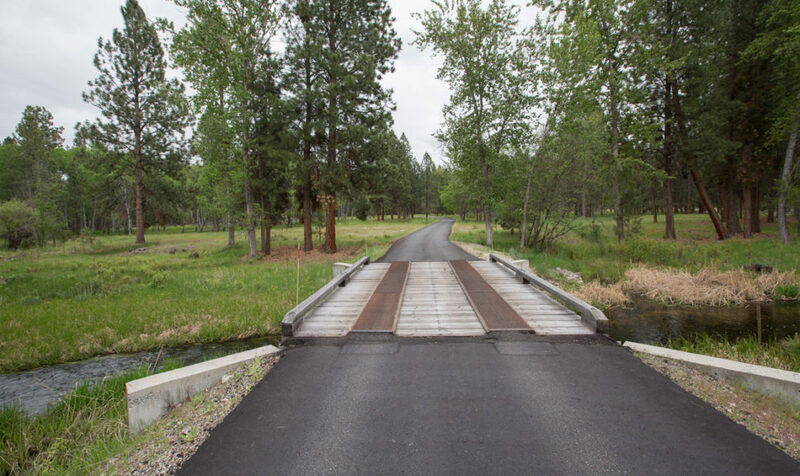 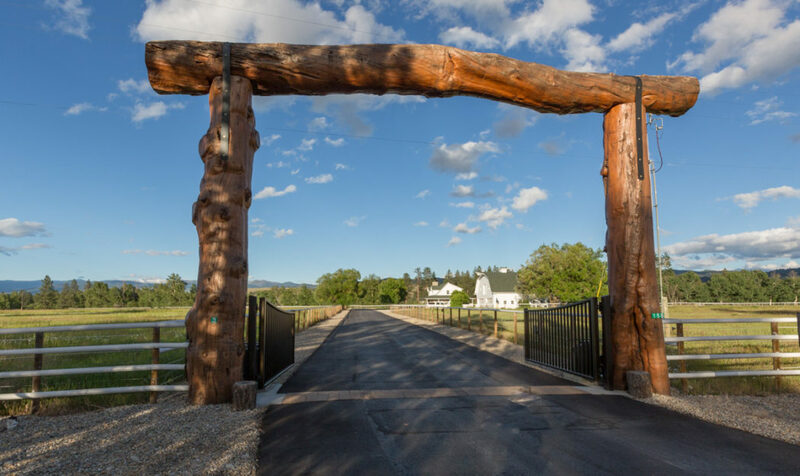 Access to the ranch is off a paved road about 5 minutes south of Hamilton through a log archway over an electronic gate. 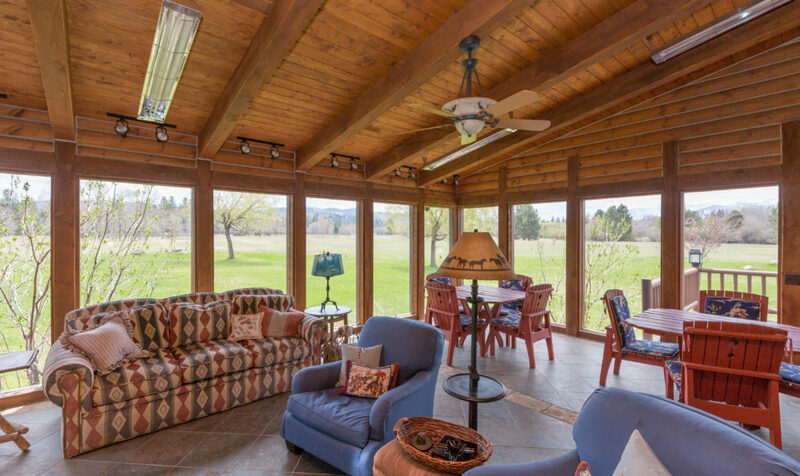 The interior roadway is paved to the owner’s residence located near the river. 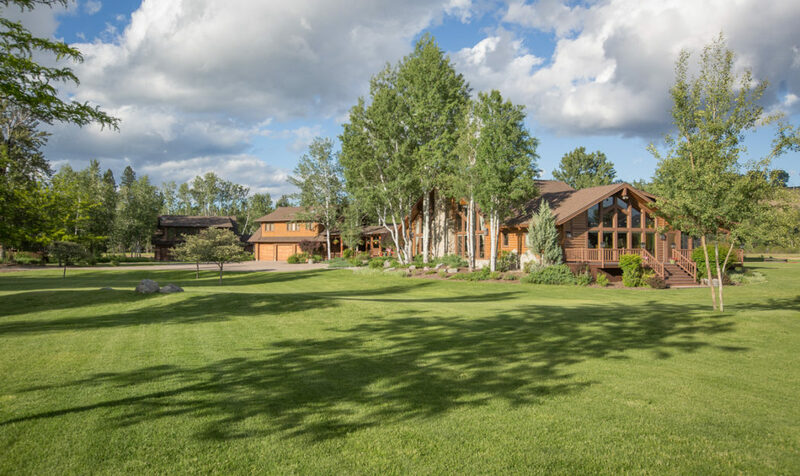 The main home has 5,100± sf with 5 bd and 5 ba on one level. 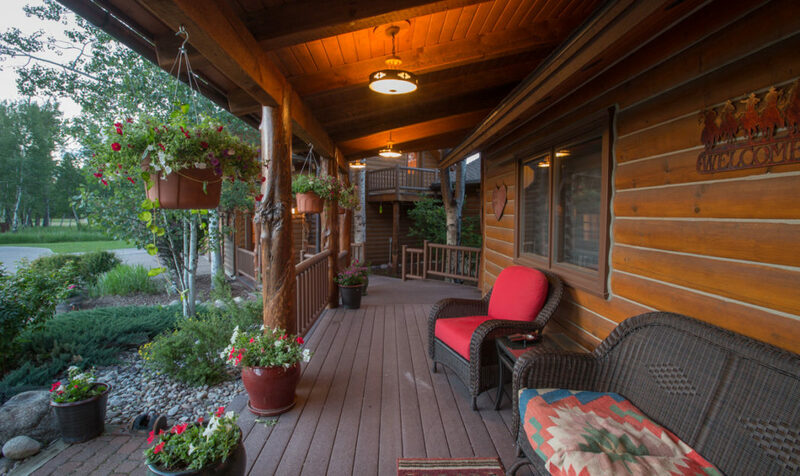 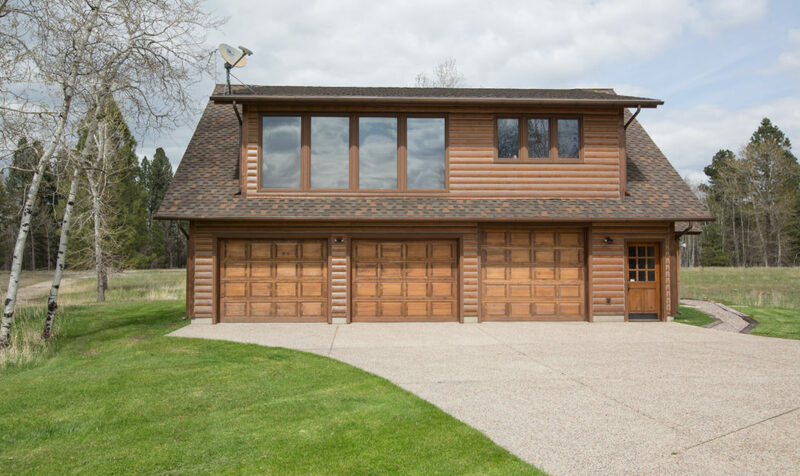 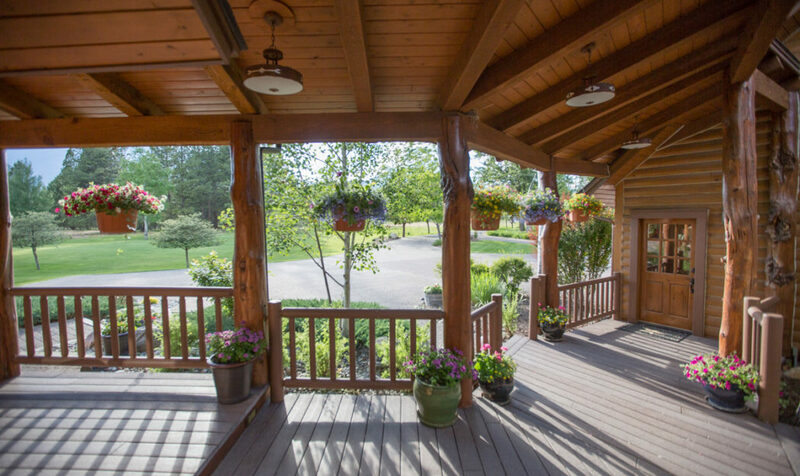 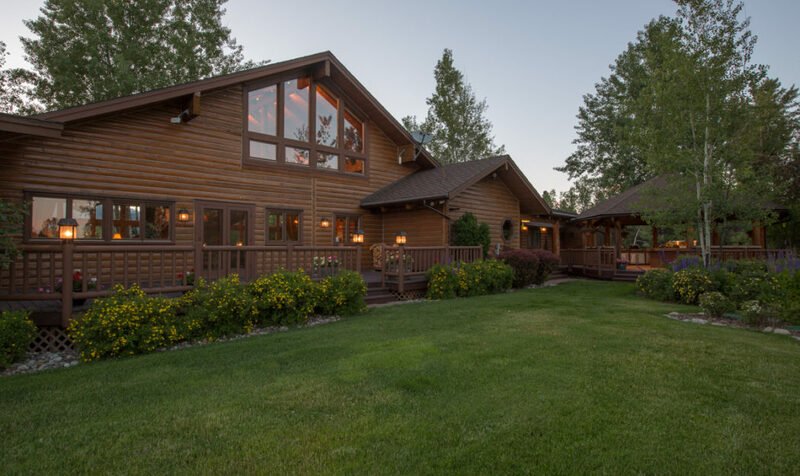 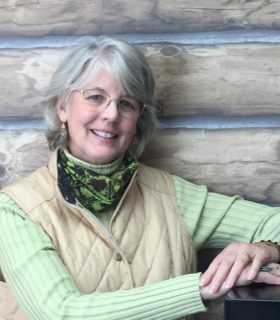 Construction is log and timber with exterior chinking, quality windows and doors, heavy composition roofing, covered porches, and copper gutters. 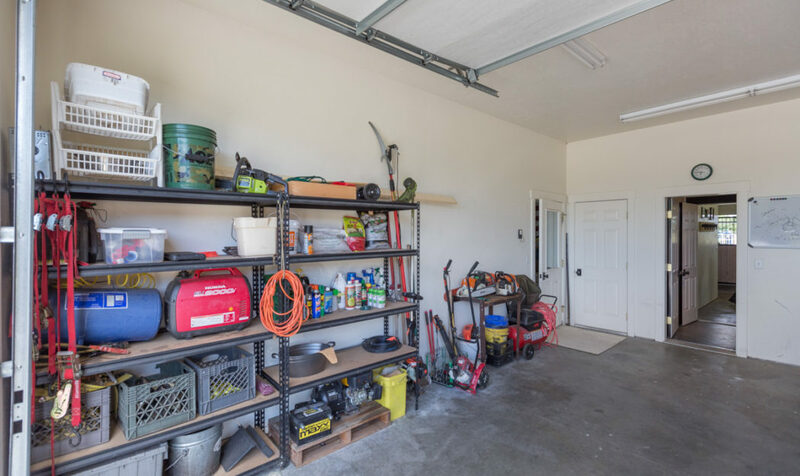 The triple car garage is nicely finished with cabinetry and has a 2 bd, 1 ba apartment above. 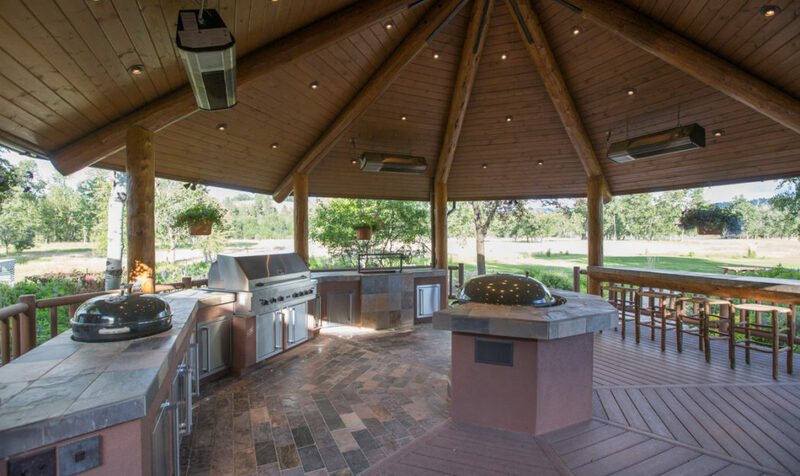 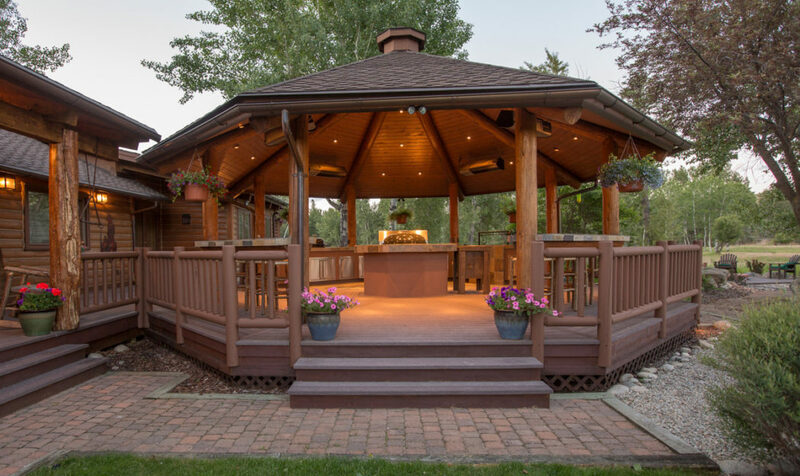 Add the huge gazebo cooking and entertaining area, patios with hot tub and fire pit, landscaping, and an expansive lawn to complete the setting. 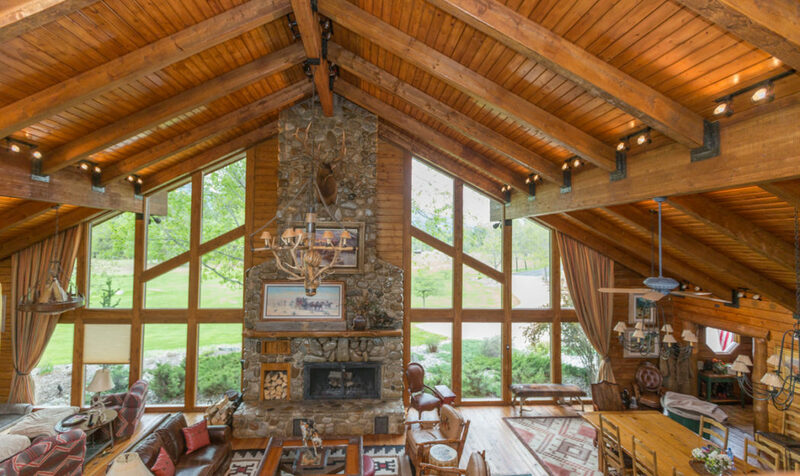 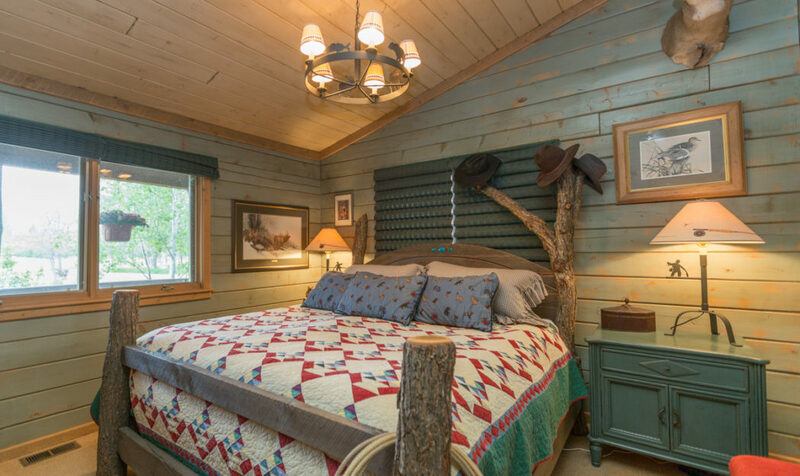 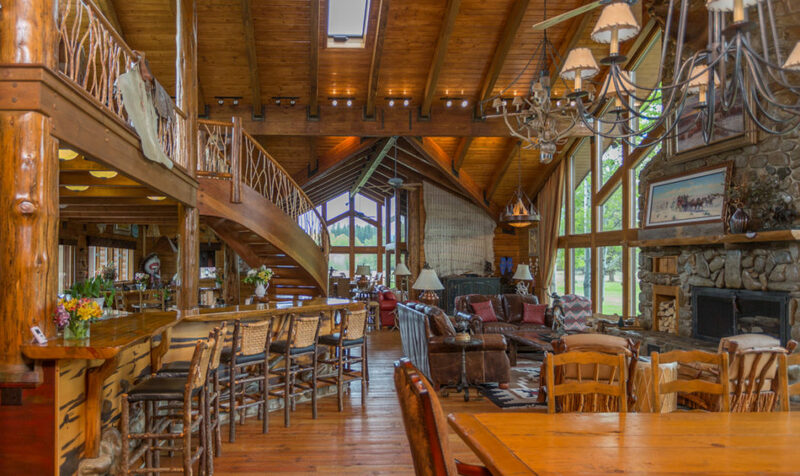 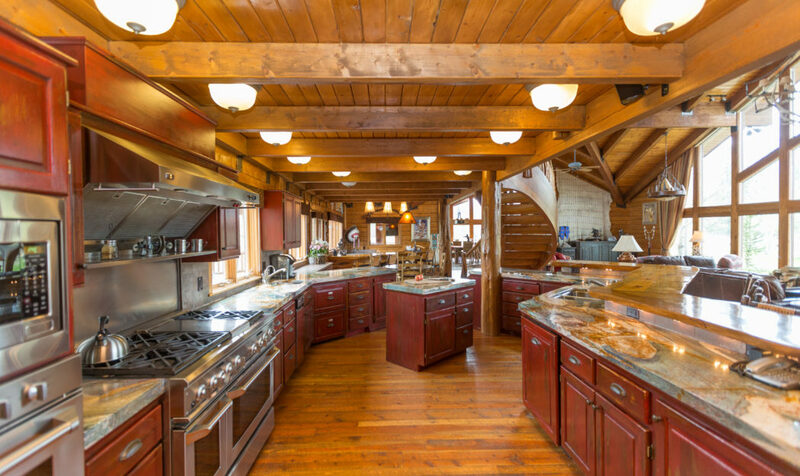 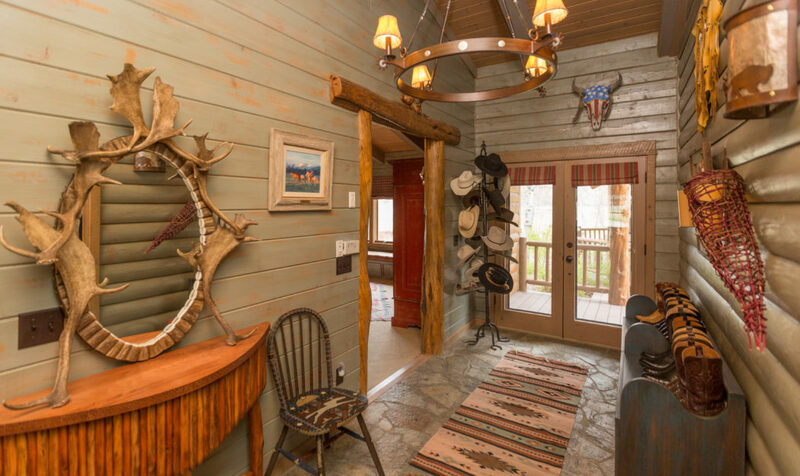 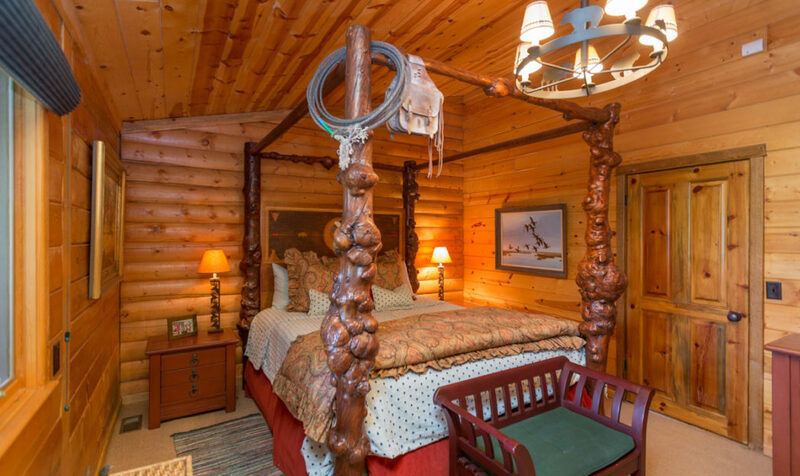 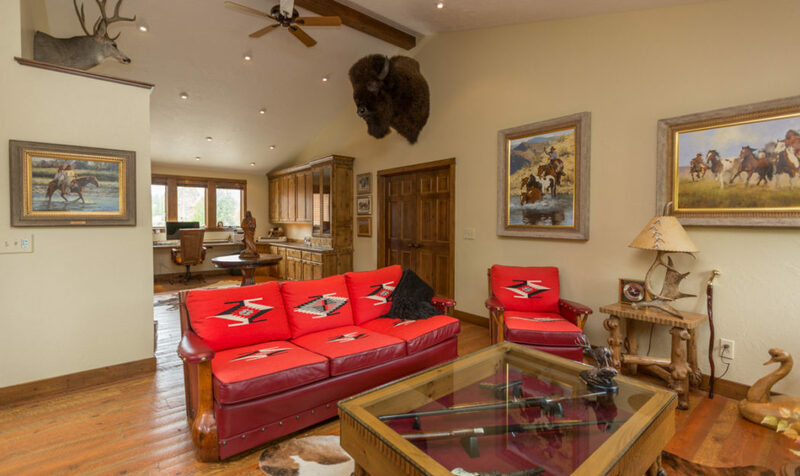 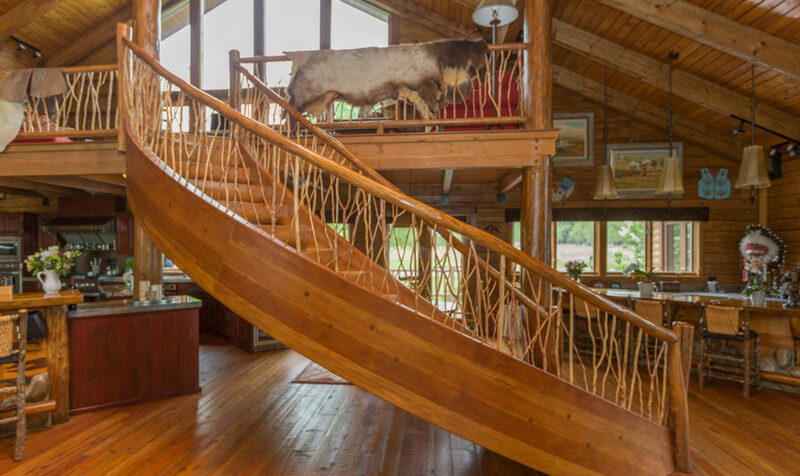 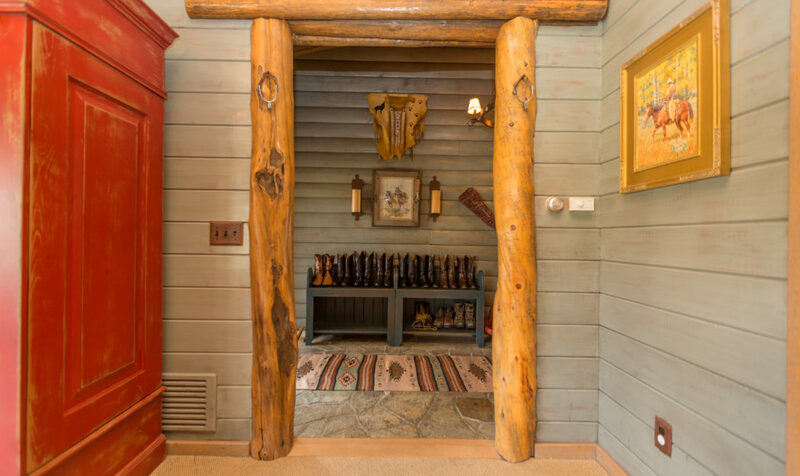 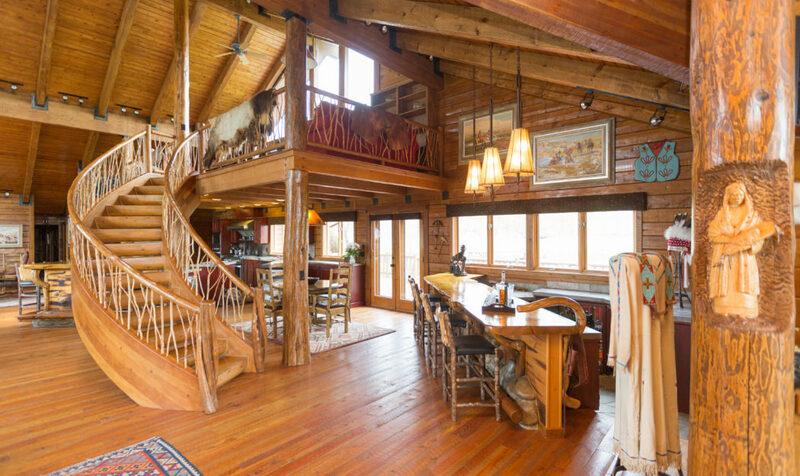 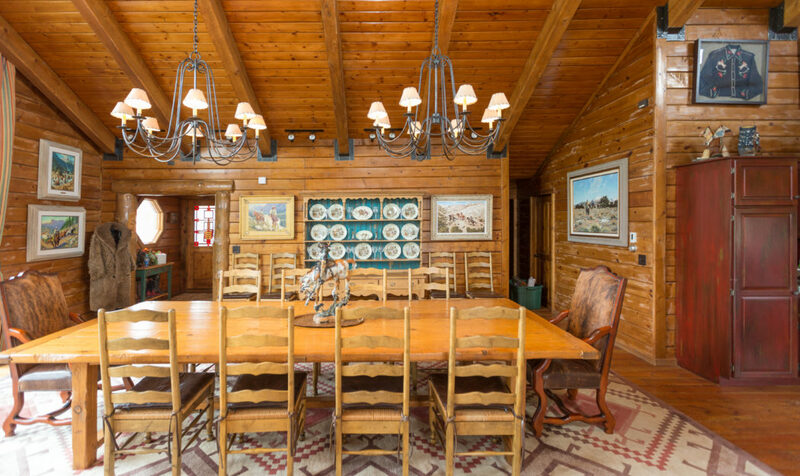 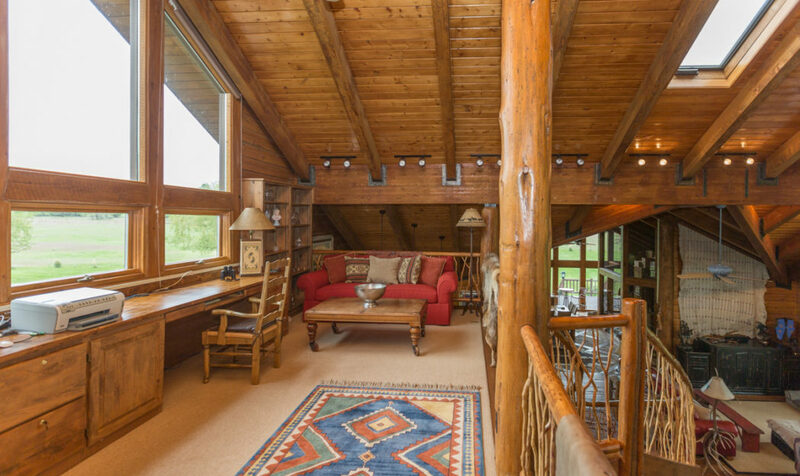 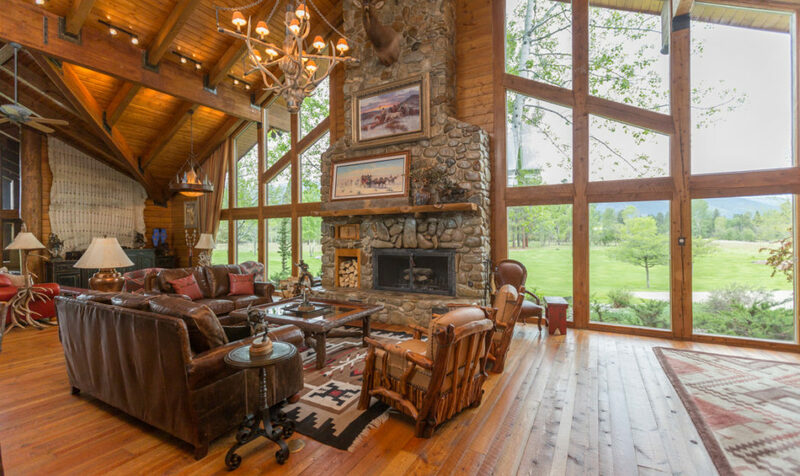 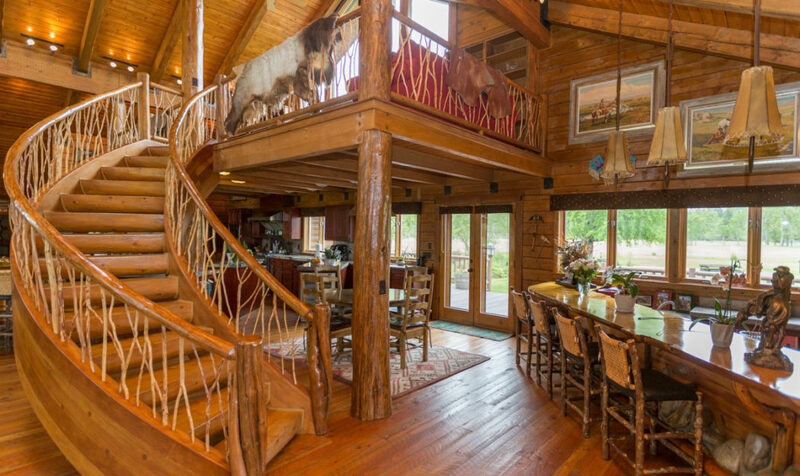 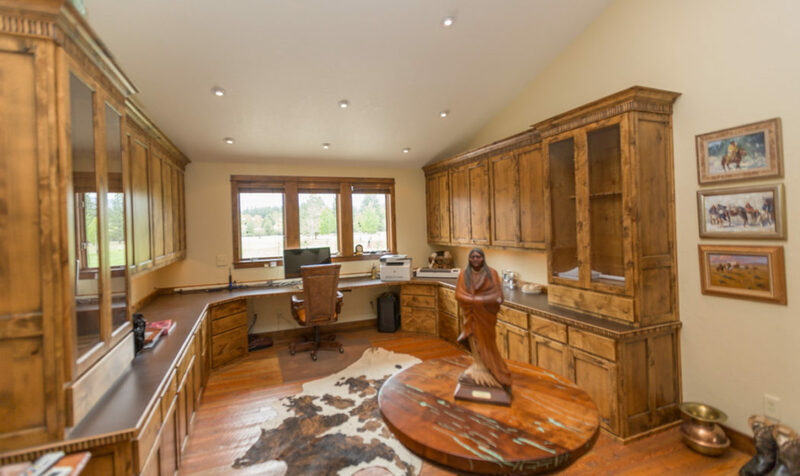 This western inspired home is a combination of old west and contemporary richness with a soaring Great Room ceiling , stone wood burning fireplace , handcrafted log chandelier, heavy timber truss work, and log pillars with carved artwork. 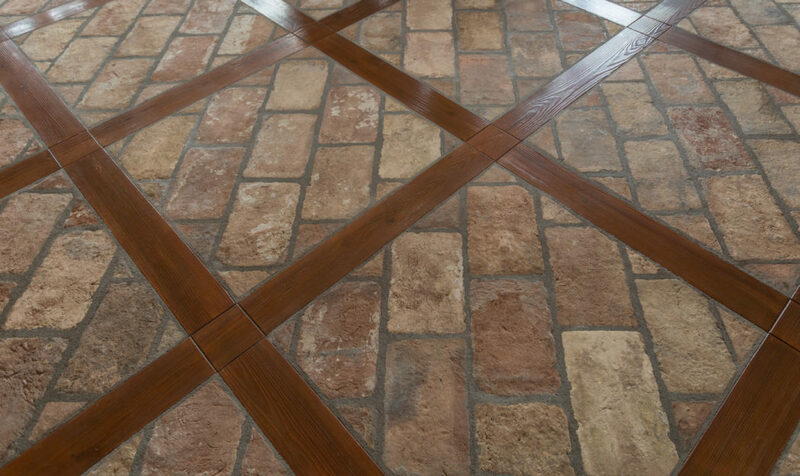 Flooring is a mixture of circular sawn fir, 1870’s French roofing tile, carpet, and stone. 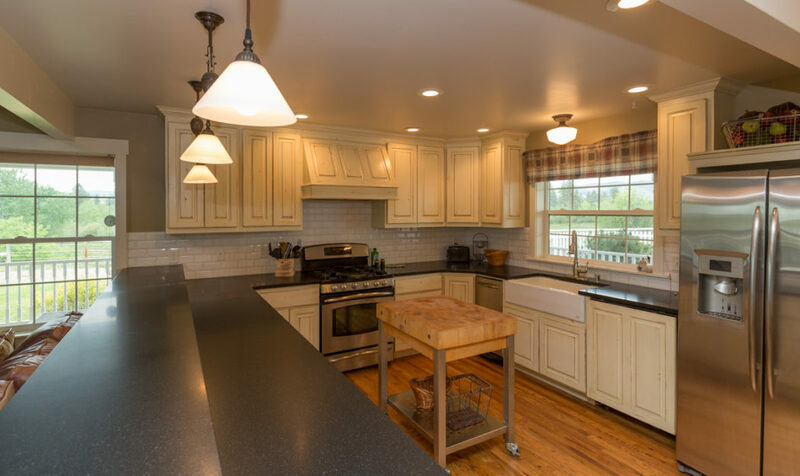 The professional grade kitchen has granite counter tops, custom red cabinetry, center island, and GE Monogram appliances featuring a propane six burner range, dishwasher and dish drawers, side by side refrigerator, and wine cooler. 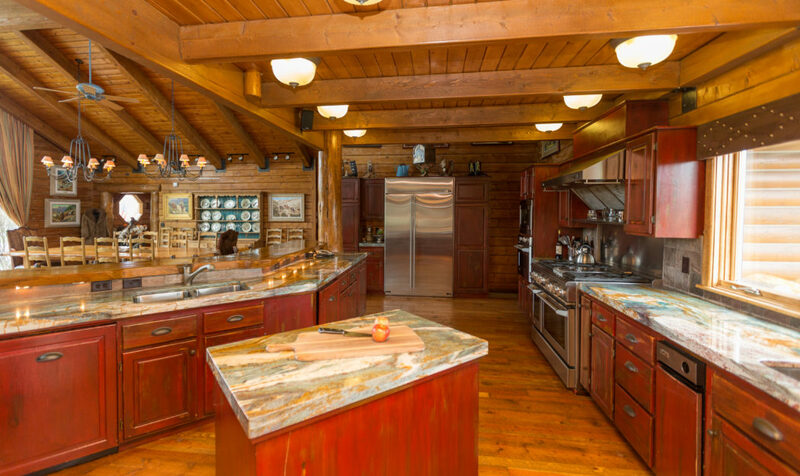 The breakfast bar features a wood slab counter plus a dinette area and butler service. 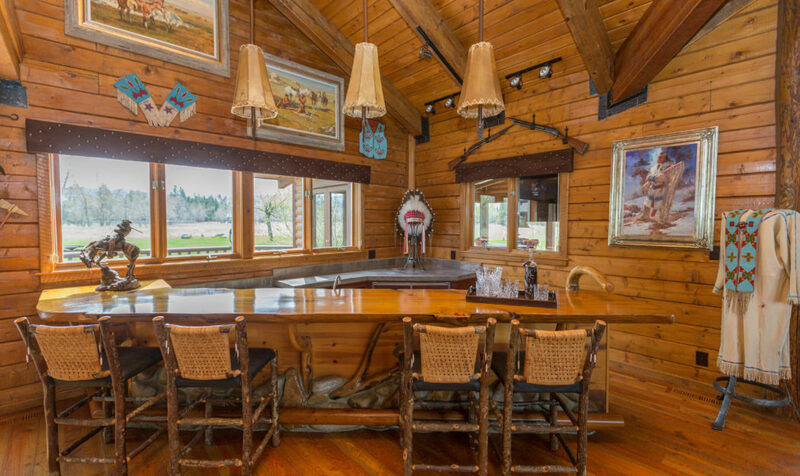 The large dining room features seating for 20 and guest will love the corner wet bar with matching thick slab counter top, river rock art accents, arrowhead lighting, leather barstool and western flair. 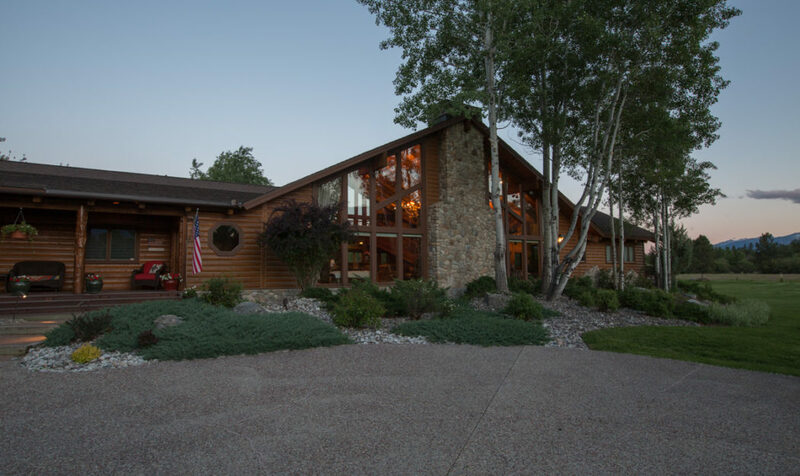 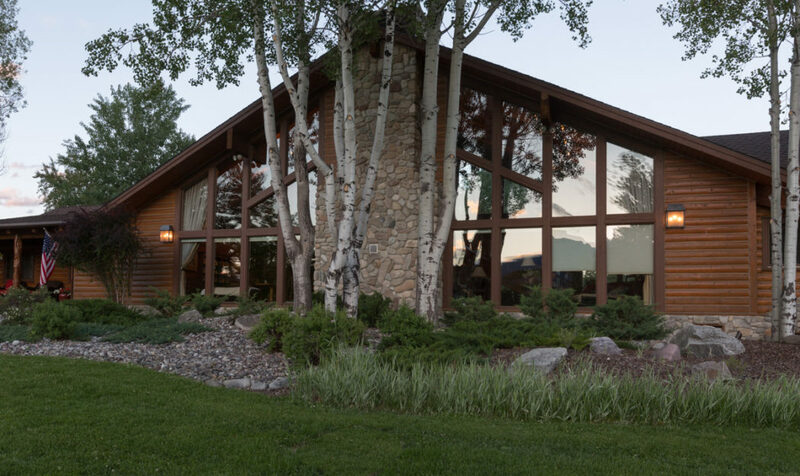 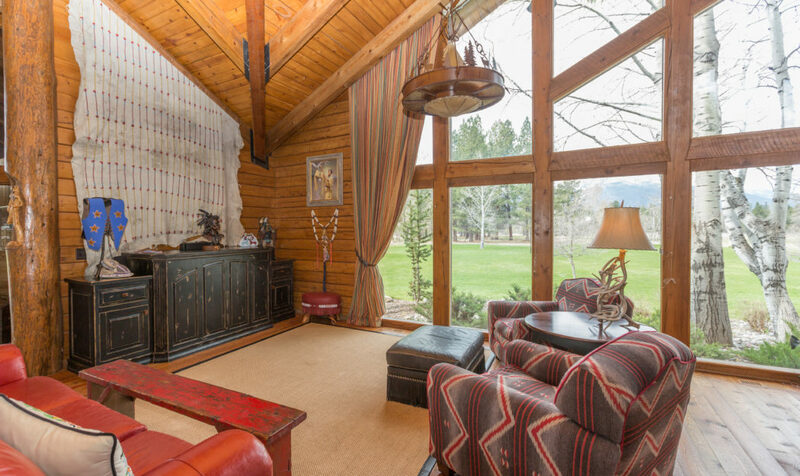 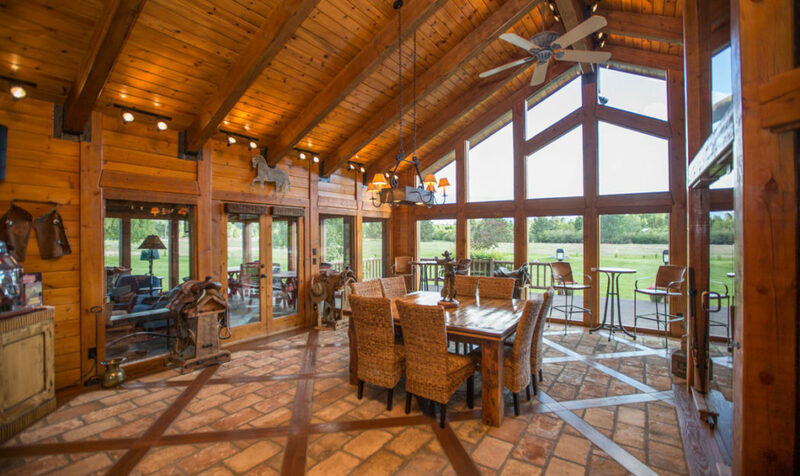 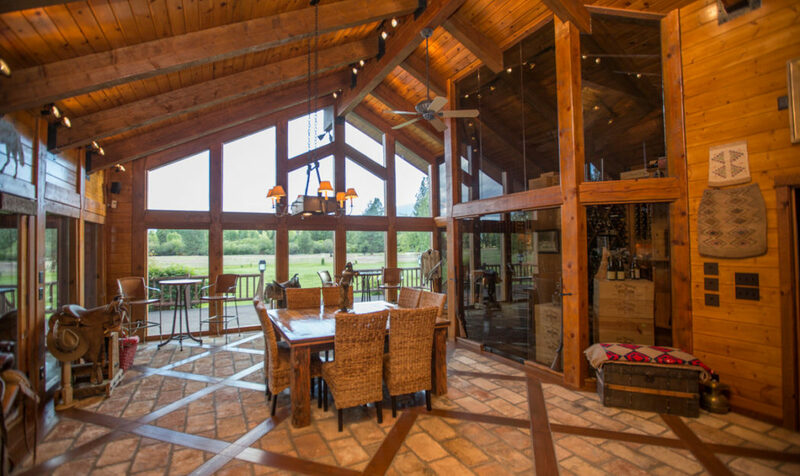 The sun room can be used for extra dining, a pool table or sitting area and features a floor to ceiling wall of glass facing south with stunning views of the ranch and Como Peaks. 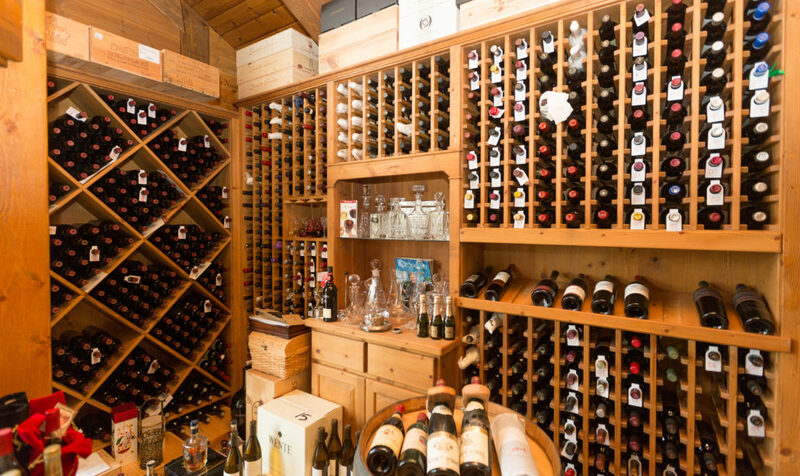 The smoked glass walk-in wine room has storage and display for over 3,000 bottles of wine. 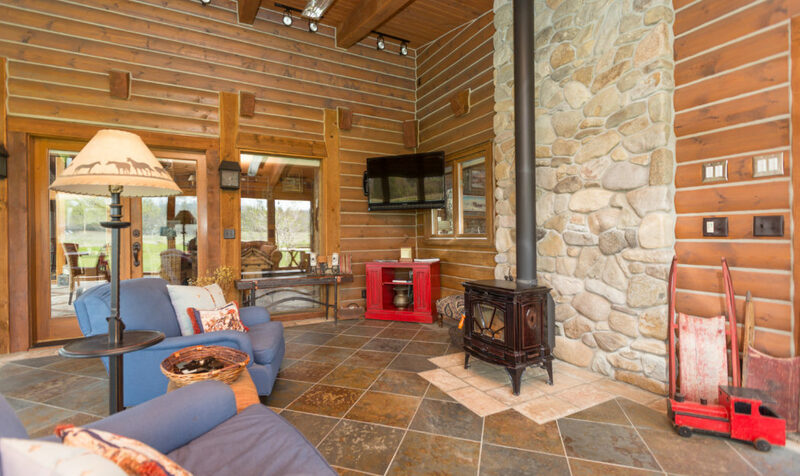 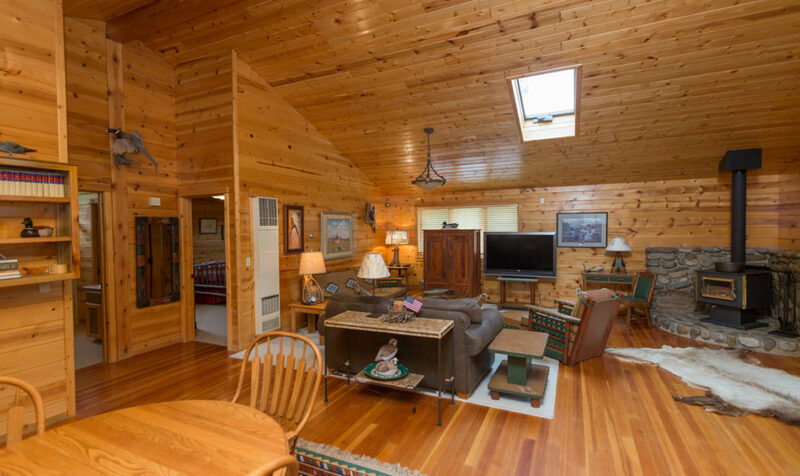 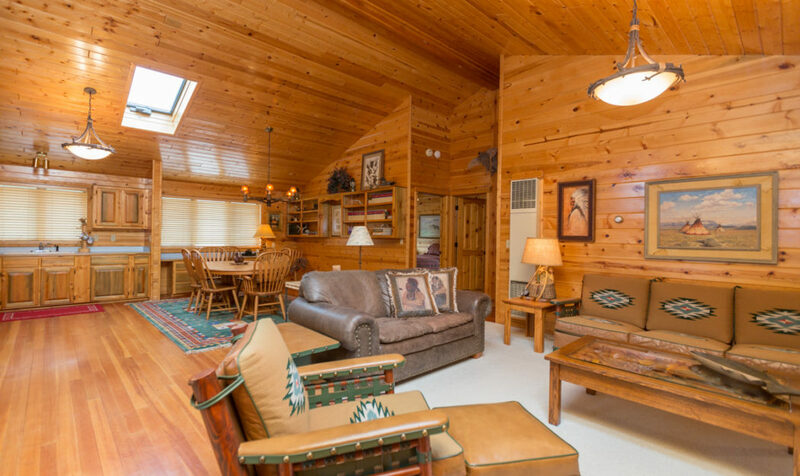 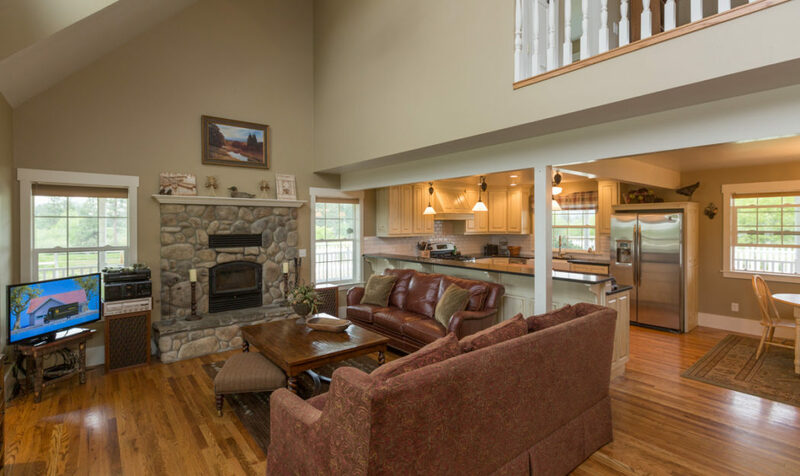 This room opens onto a large heated screened in porch with slate floor. 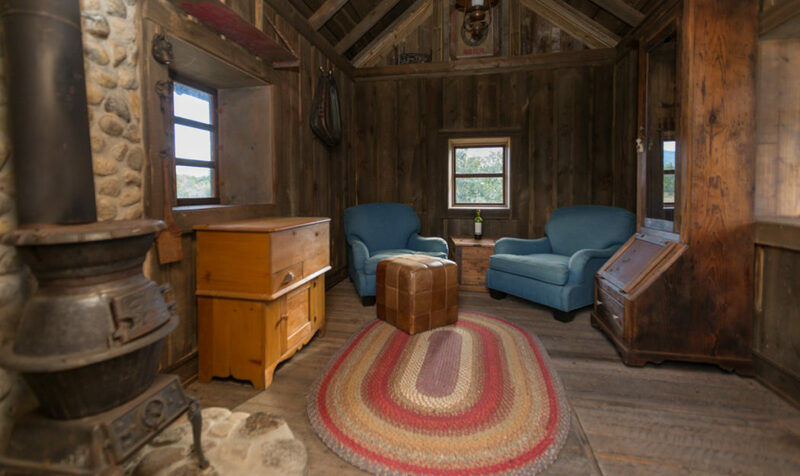 The intimate corner of the Great Room has both media and music systems and is graced with a dramatic circular log stairway with twig pickets and one-piece log handrails leading to the open office overlooking the Great Room and the back of the home where walking paths lead to the fenced raised garden beds, charming homestead bunkhouse, and out to the banks of the Bitterroot River. 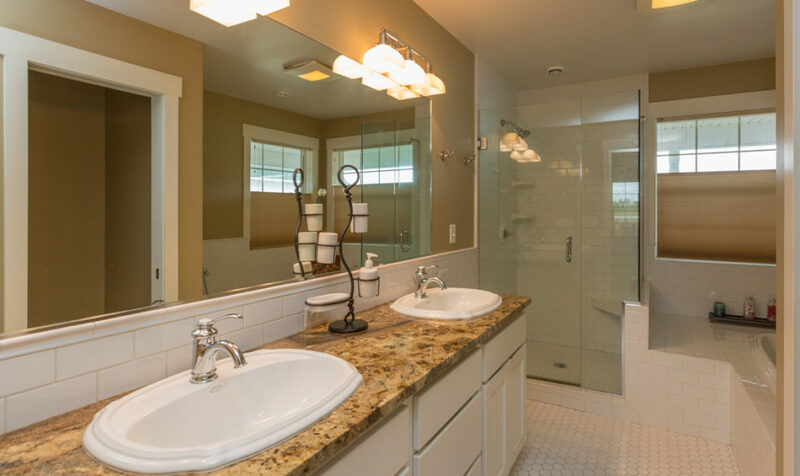 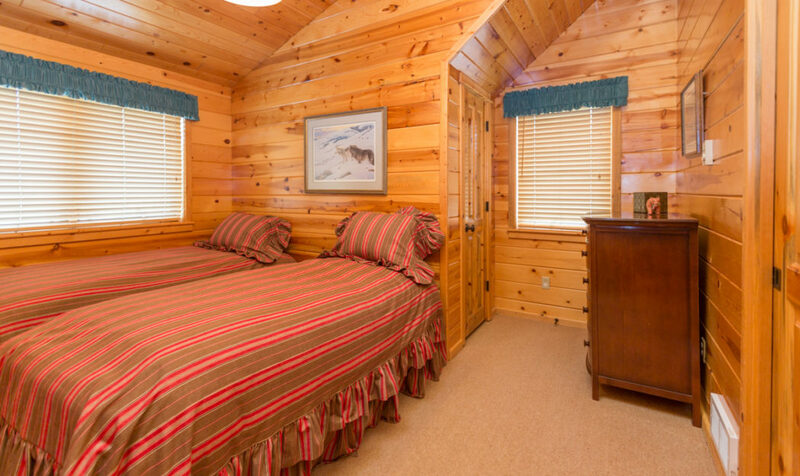 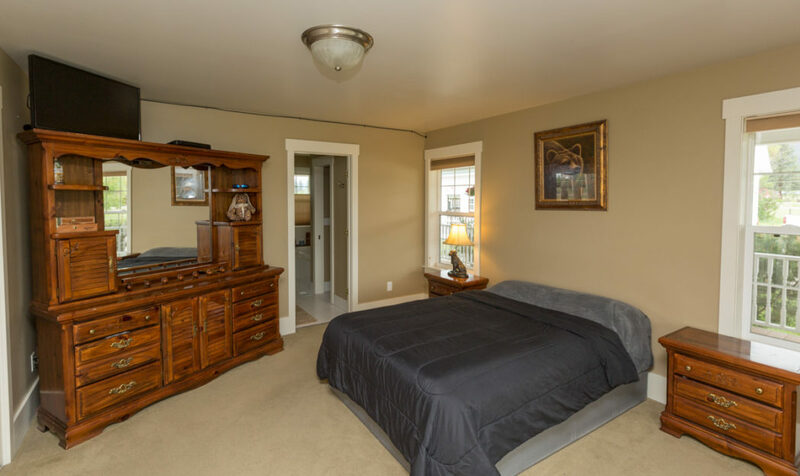 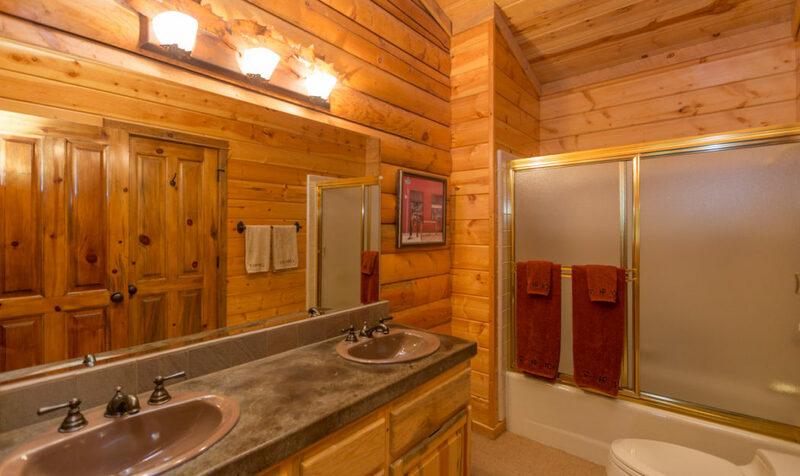 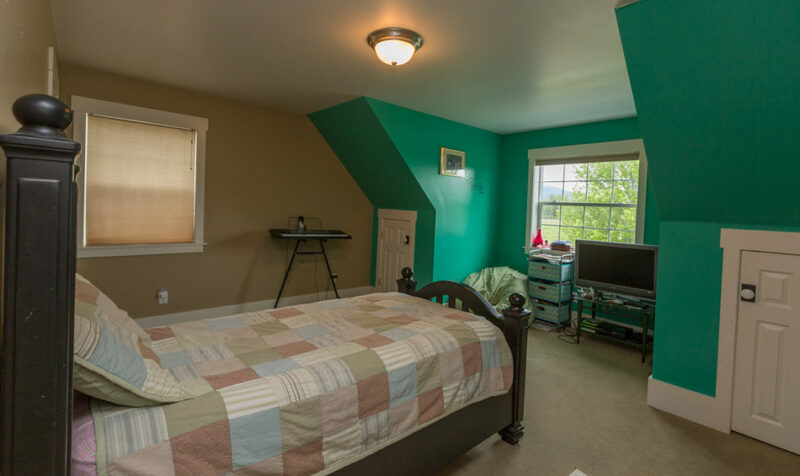 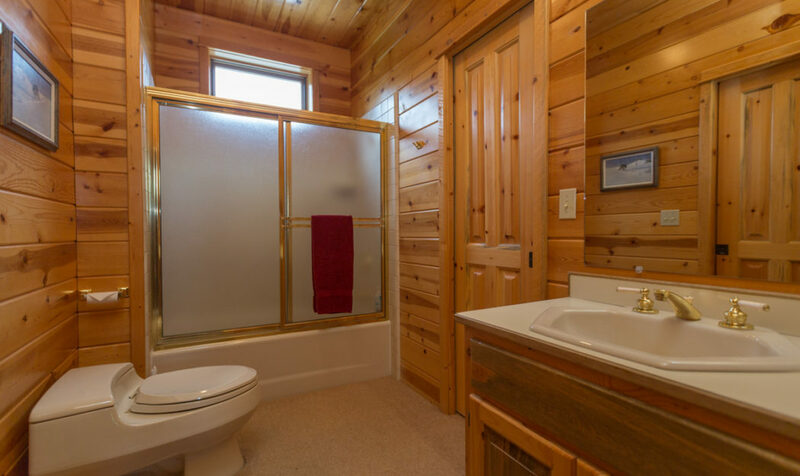 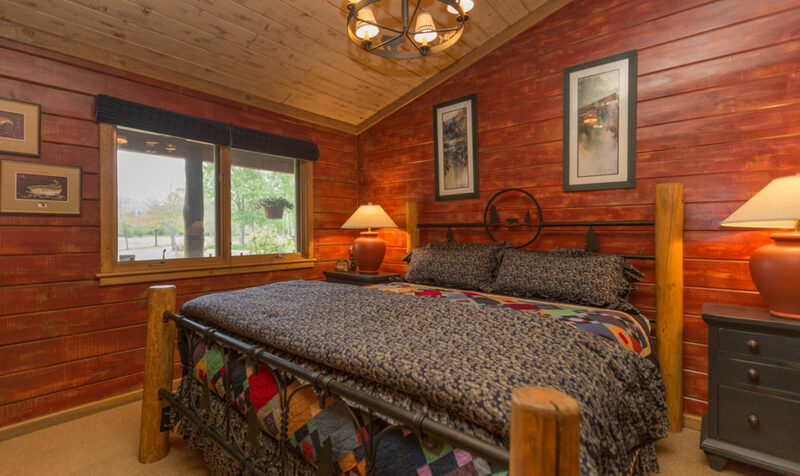 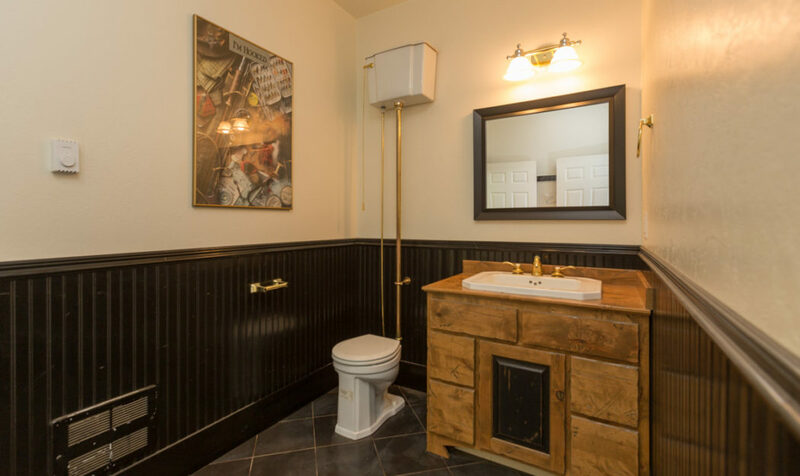 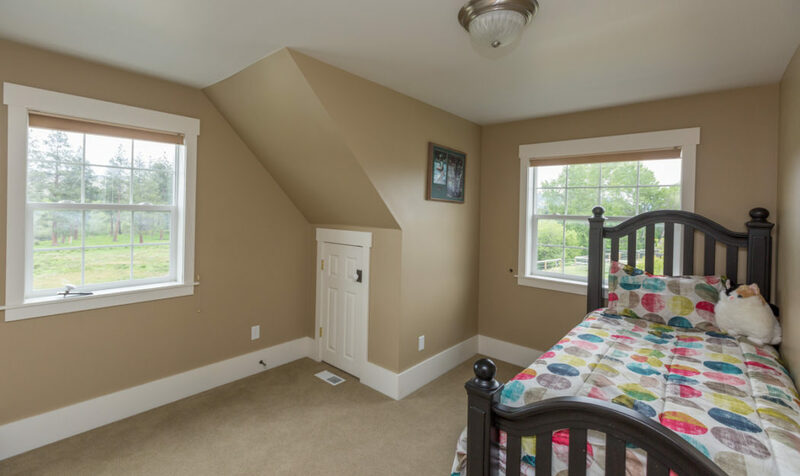 The master bedroom is located at the end of the guest bedroom hallway with 4 guest bedrooms and two connecting baths. 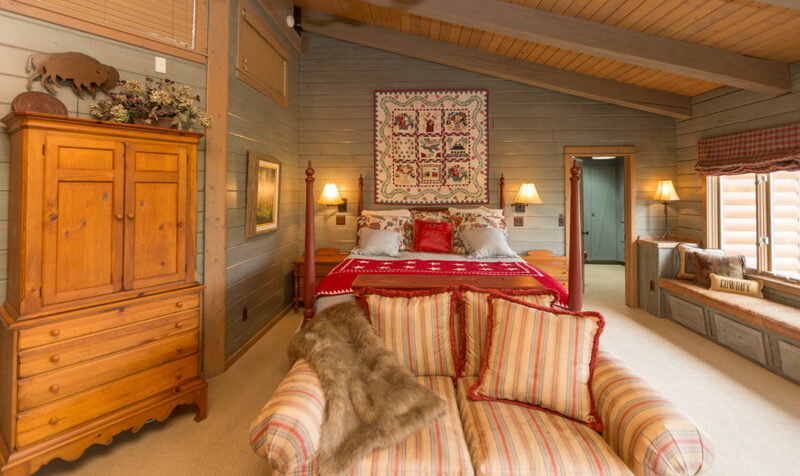 The master bedroom boasts a thirty foot window seat, clearstory windows and skylights, two walk in closets and a spa bathroom with double vanities, pounded copper sinks, custom lighting, tile, and bronze fixtures. 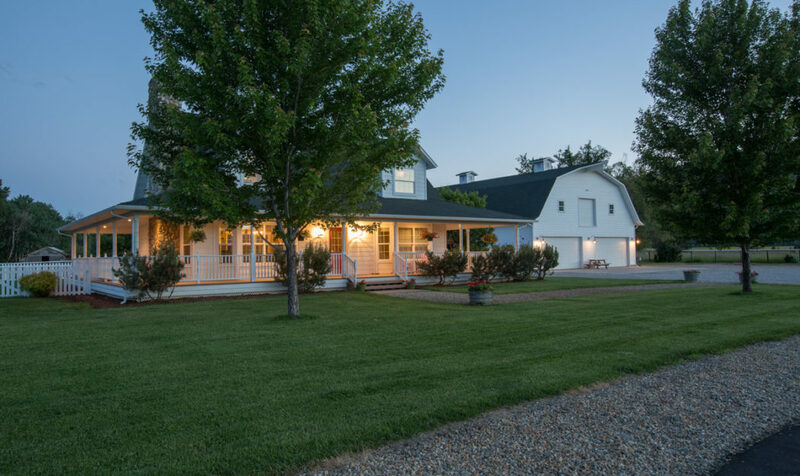 A separate structure just north of the main house is served by the same exposed aggregate circular driveway, and features an executive office suite over an additional three car garage. 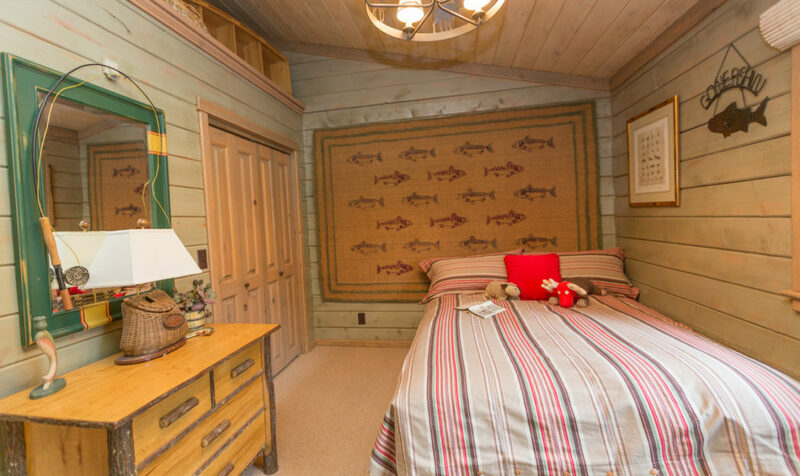 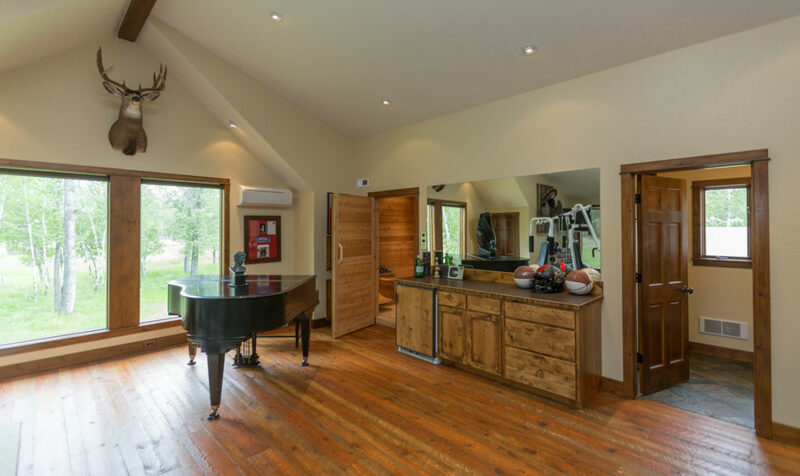 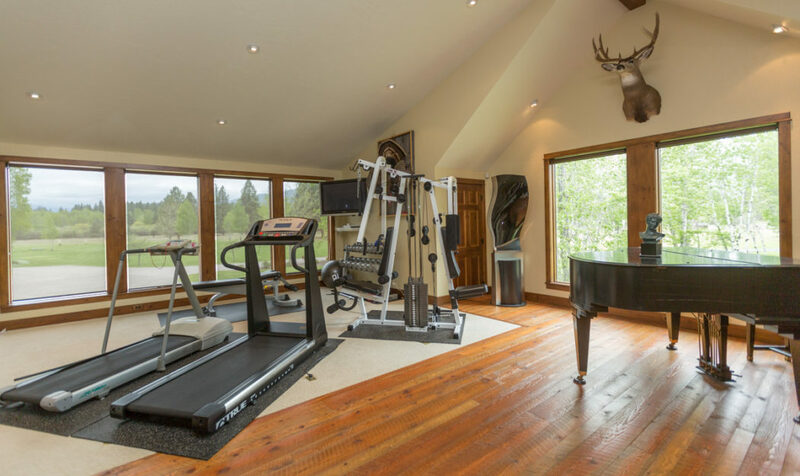 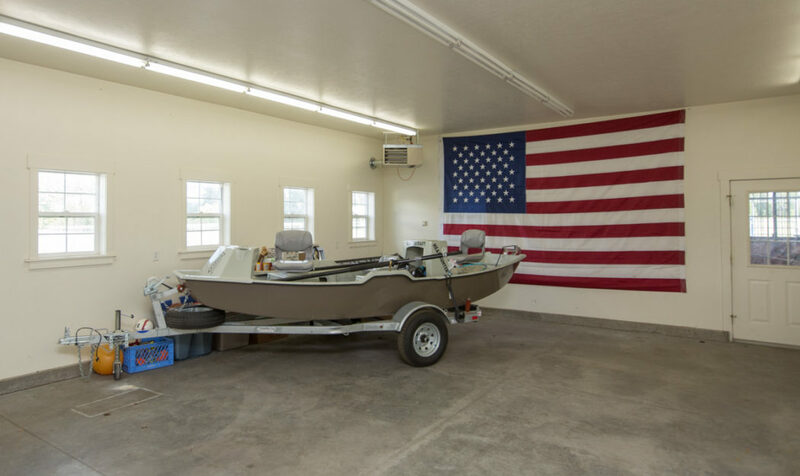 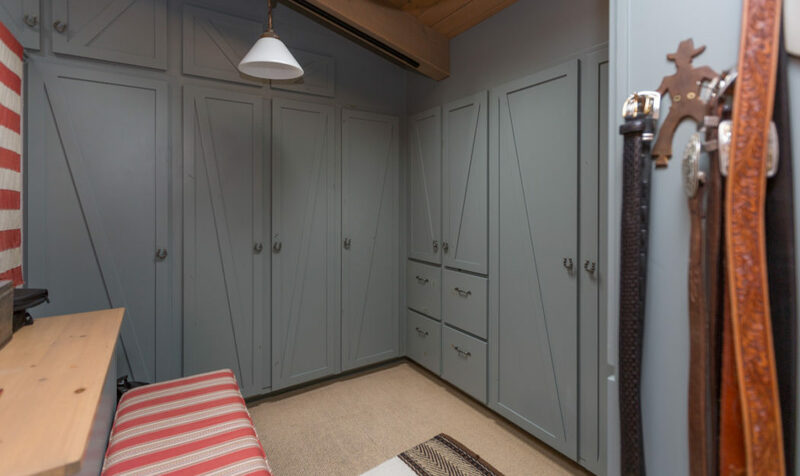 Also included are a sporting room , walk-in vault, covered shooting bench, and more. 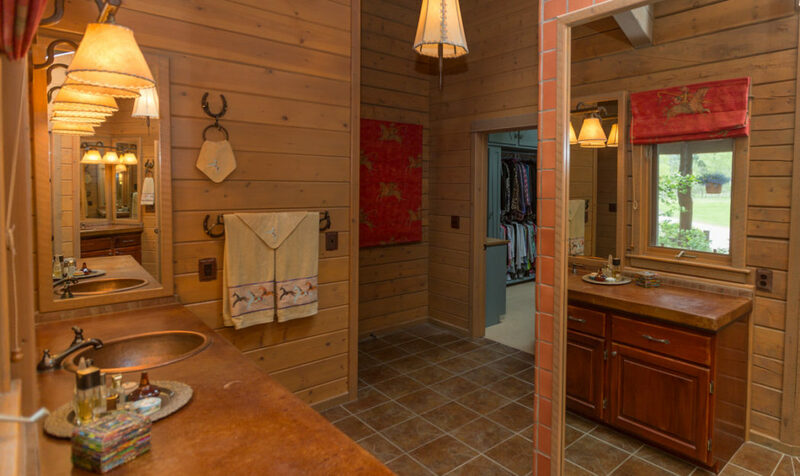 The executive office suite features alder cabinets, vaulted ceilings, and recessed lighting. 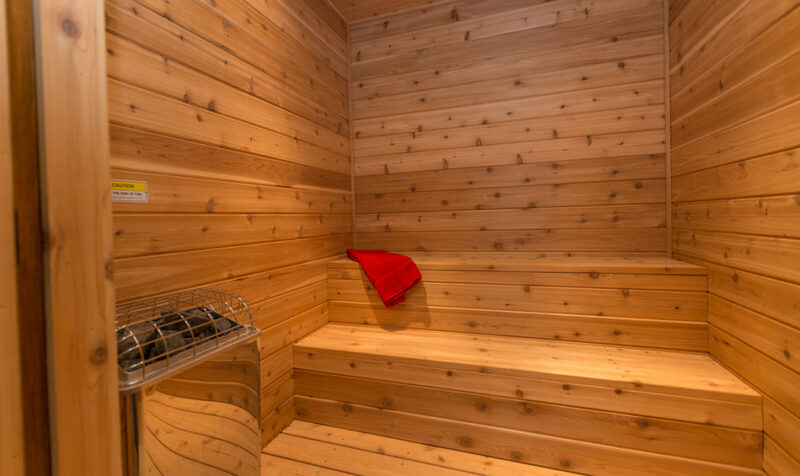 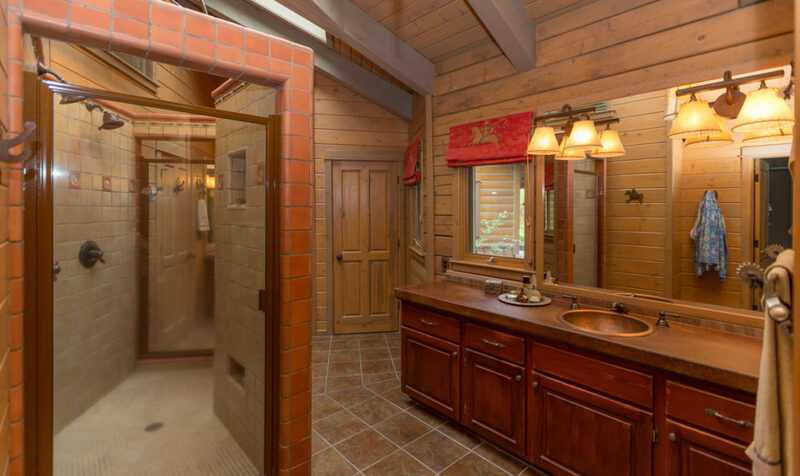 The exercise area has mirrored walls, service bar, bath with steam shower, and sauna. 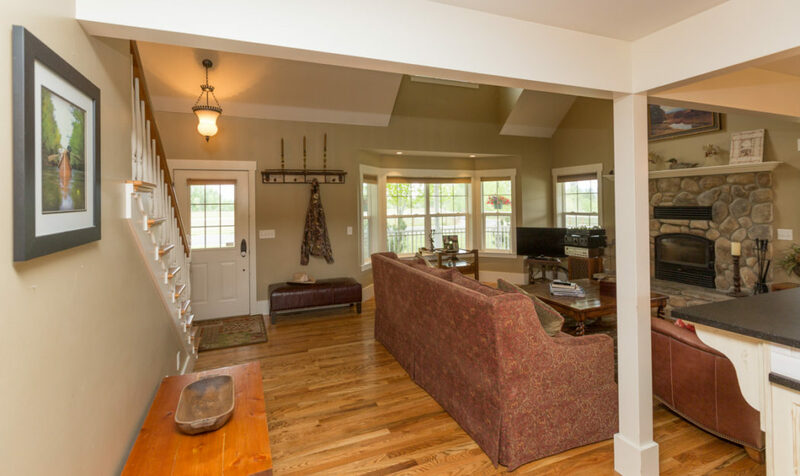 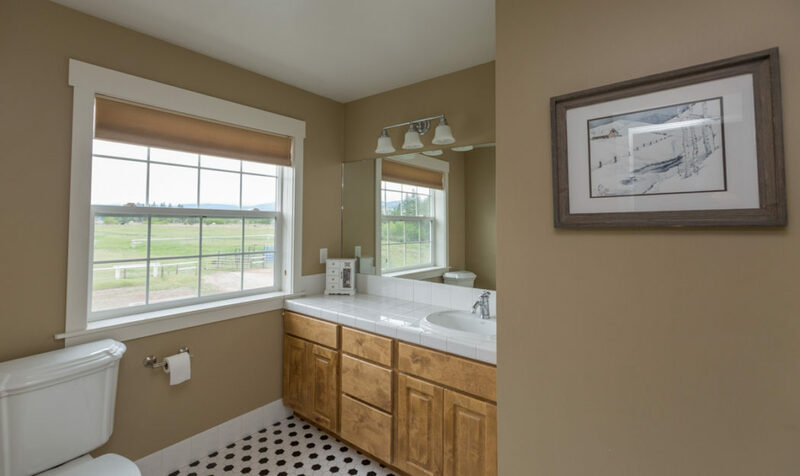 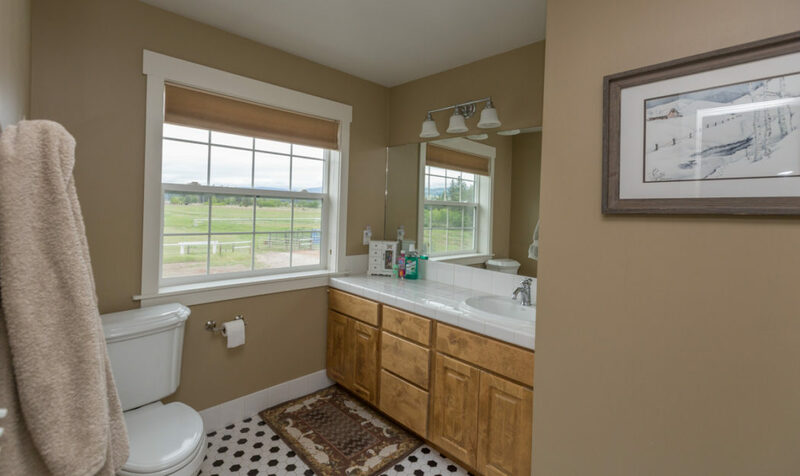 The additional home features two stories with 2,100 square feet, three bedrooms, two baths, country French kitchen, and wraparound porches with views. 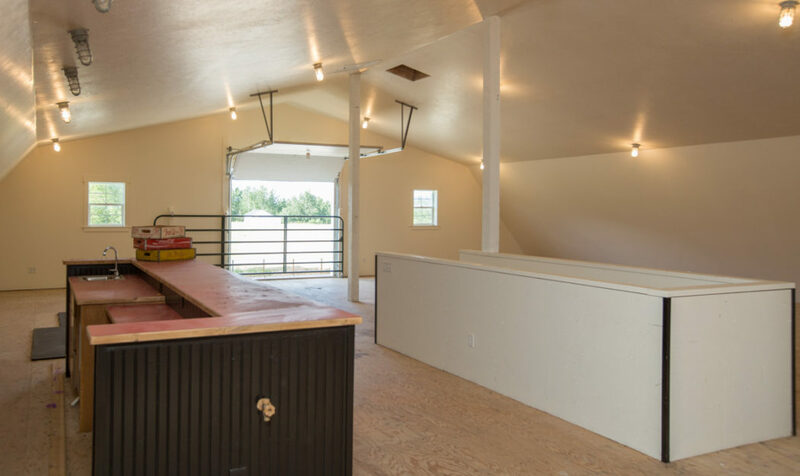 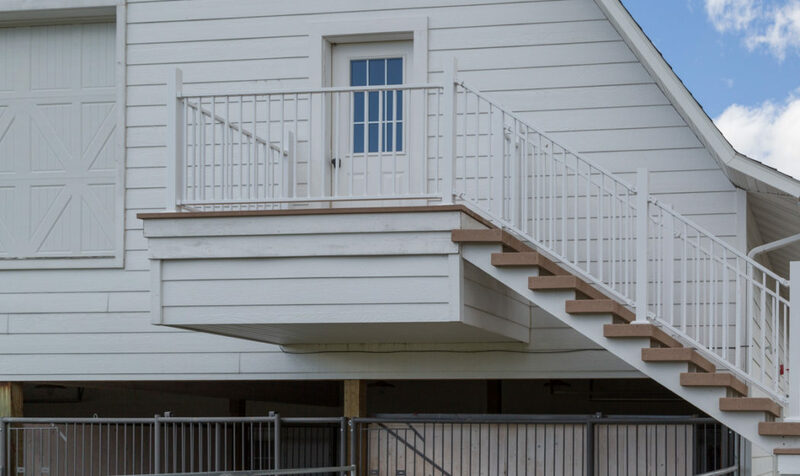 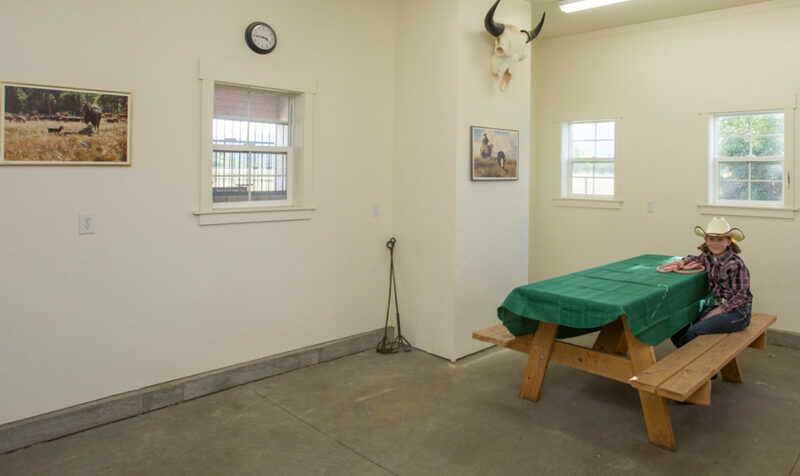 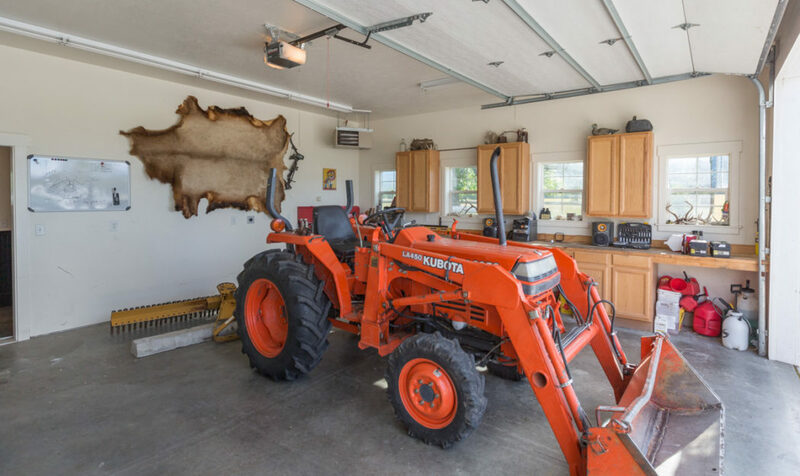 The 3,000± sf horse barn has a lower heated shop, garage bays, bath, center alley, deluxe horse stalls plus a full hay loft with exterior stairway. 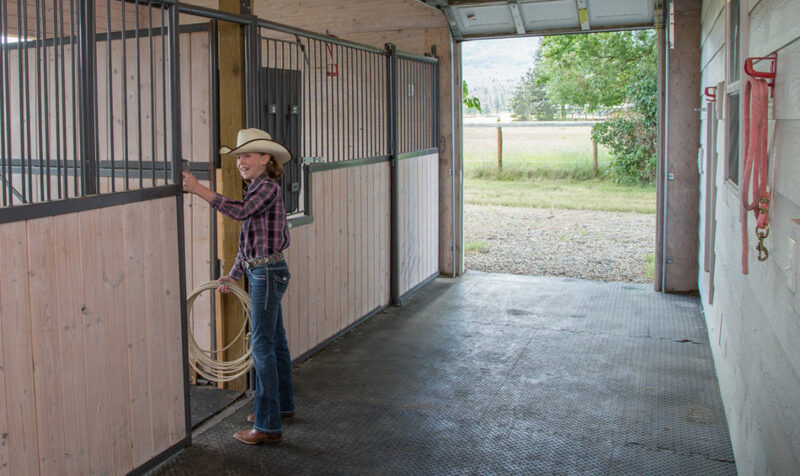 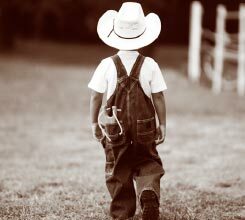 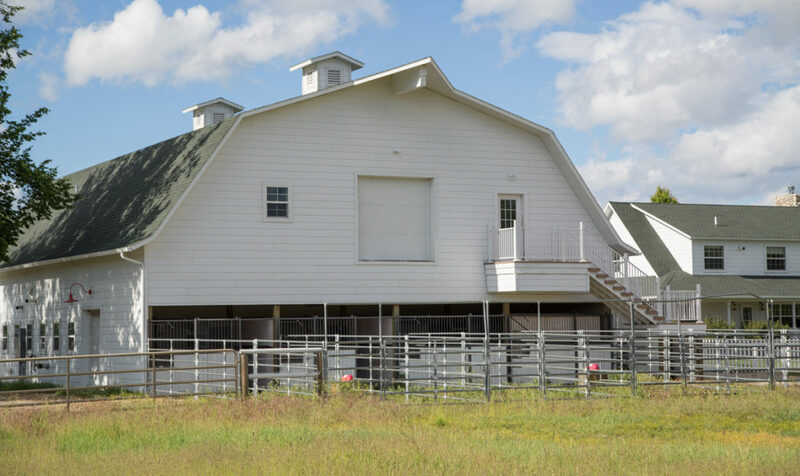 Additional shops, homestead chicken house and run-in sheds are located on the ranch with fencing and cross fencing. 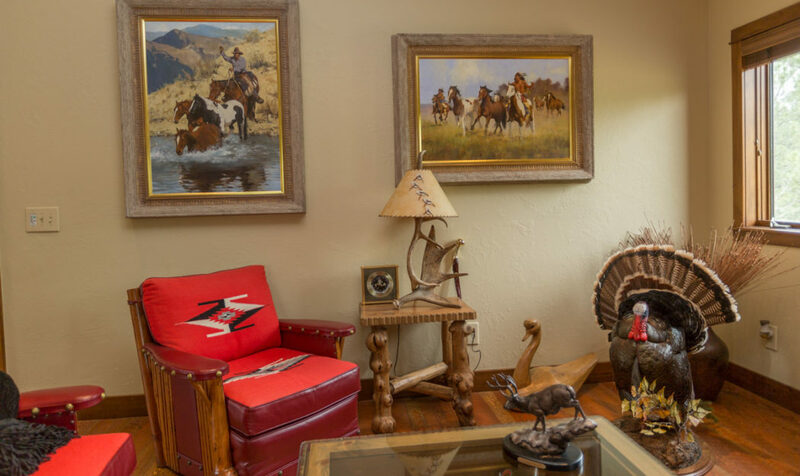 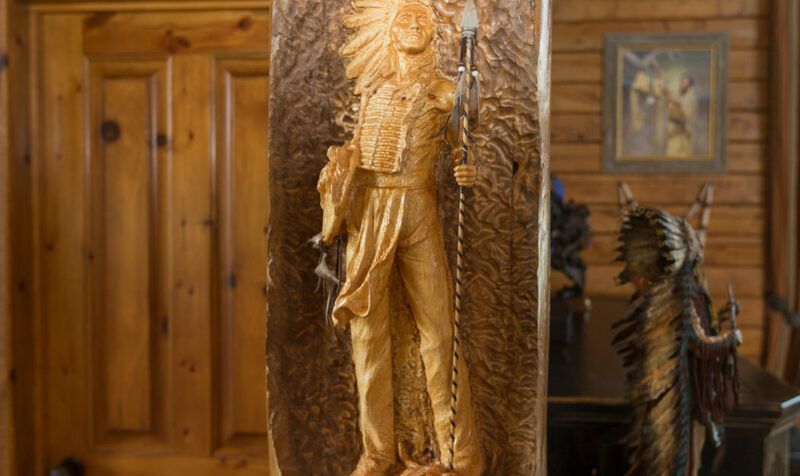 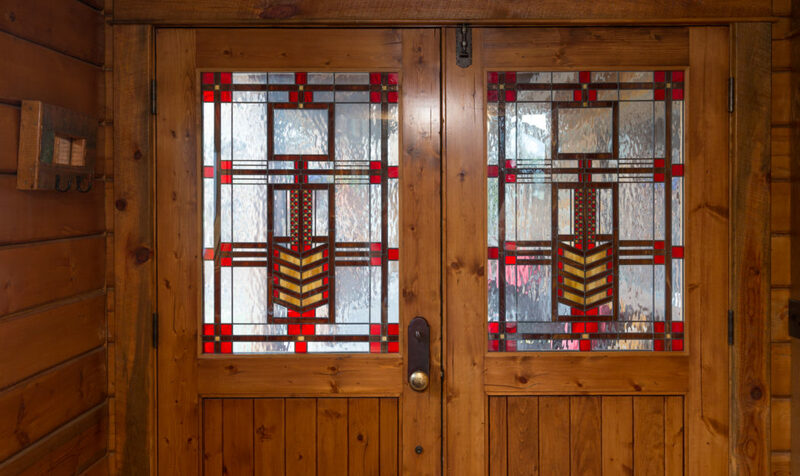 Included in the price are museum-quality original art and bronzes, authentic Native American pieces, old west cowboy collections, Thomas Molesworth furniture sets, home furnishings, and ranch equipment.